So, I’ve been a lazy cook lately, mainly repeating old favorites or making simple meals but lucky for me, Grant (also known as Big Smokey when he plays guitar!) has been picking up the slack in our household. I feel very fortunate to have a partner who not only enjoys eating with me but also, he can cook! 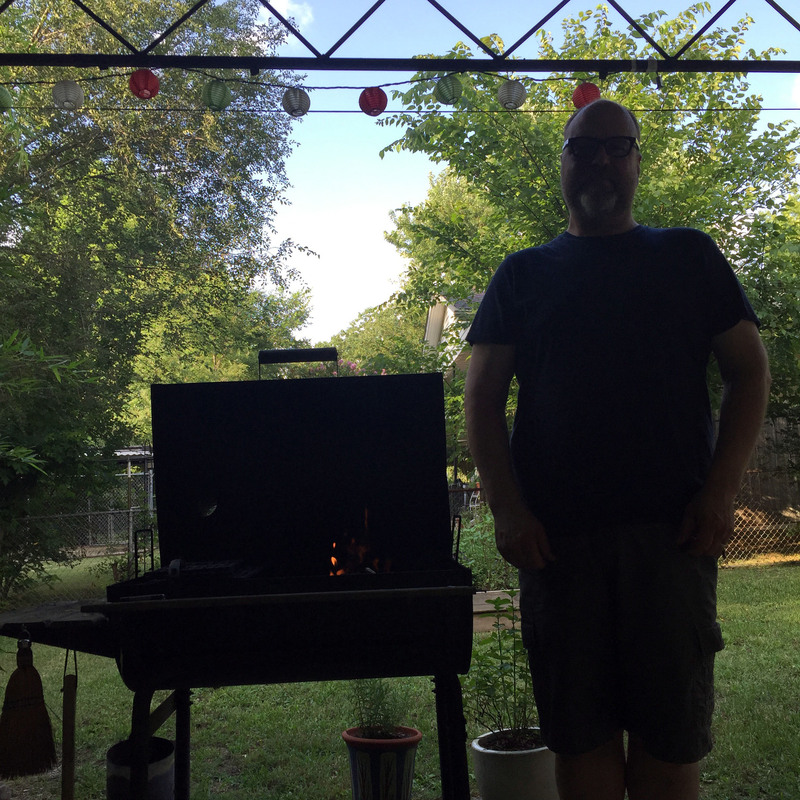 He came up with these two great new meaty recipes. I wanted to post these right away as he incorporated many of the yummy late summer veggies we’ve been getting here in middle Tennessee right now. Enjoy! 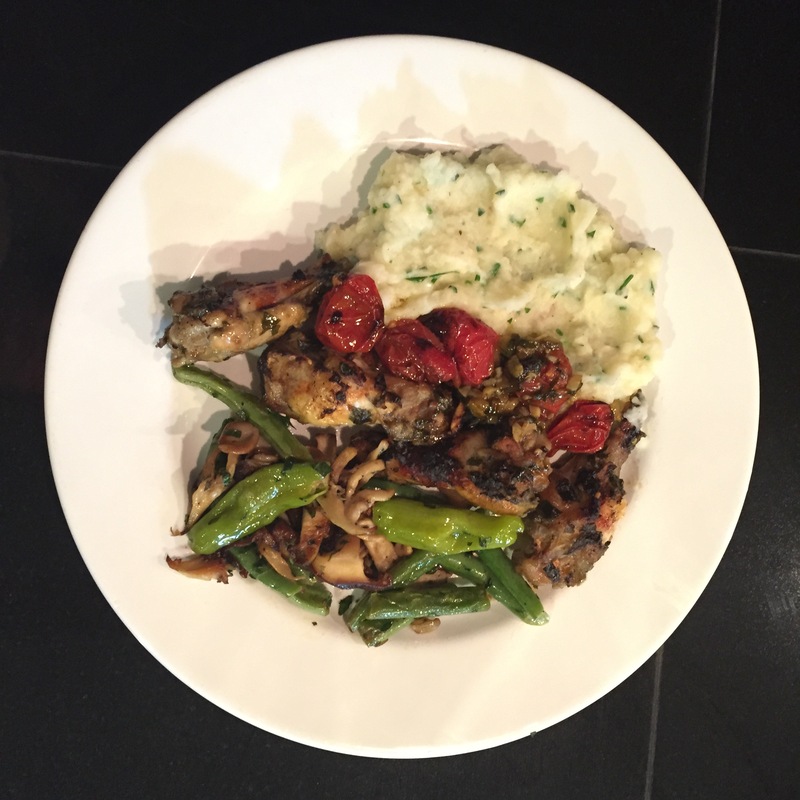 Mediterranean Chicken Wings with Roasted Cherry Tomatoes served alongside Herbed Mashed Potatoes (Chives and Parsley) and Sautéed Green Beans with Shishito Peppers & Mushrooms. 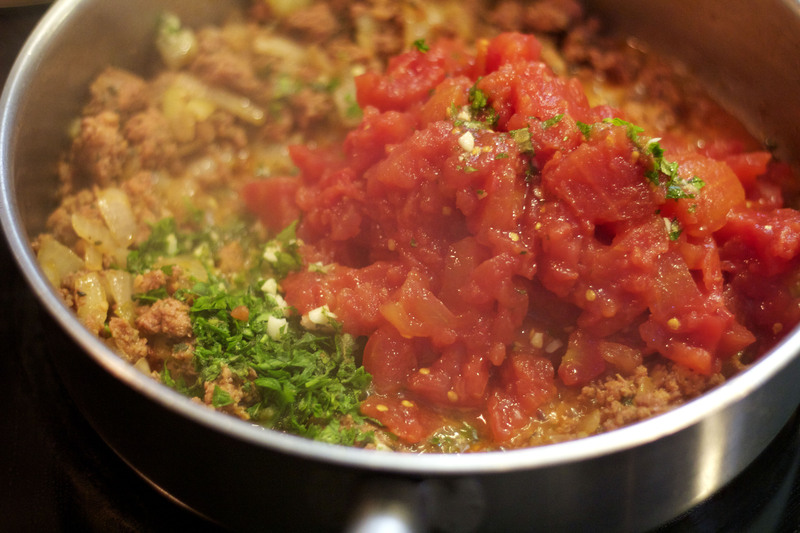 Mix all ingredients, except chicken and tomatoes, in a large bowl. Add chicken drumettes, mix, and cover. Set in fridge for about an hour. Preheat oven to 400. 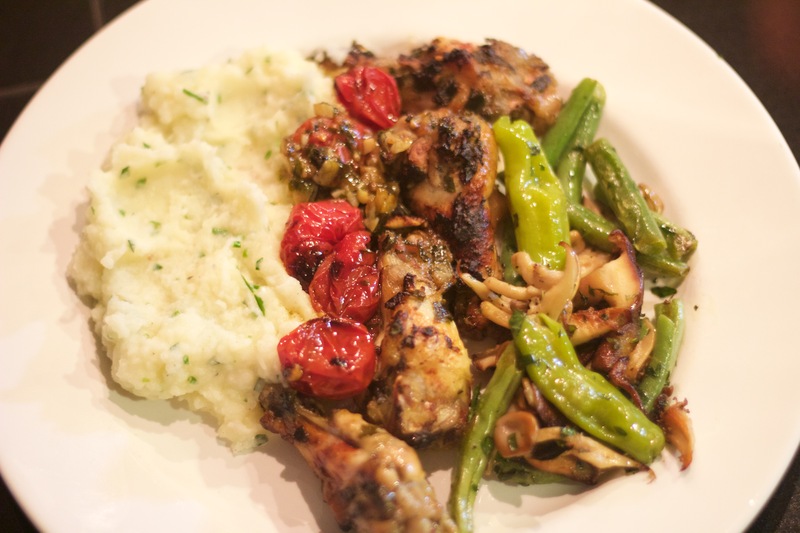 Place chicken in a large iron skillet or baking dish. 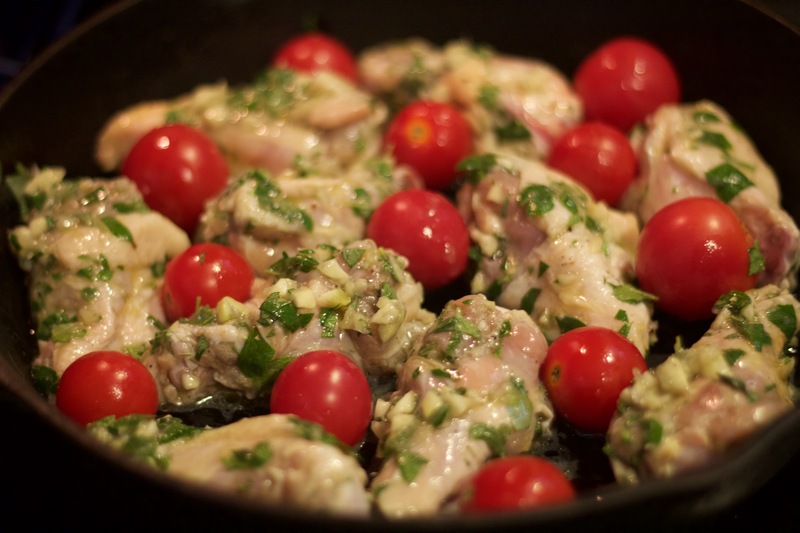 Arrange tomatoes between chicken drumettes, evenly spread out. Place in oven and roast for 25-30 minutes. Turn oven to a high broil for approximately 5-7 minutes, until the tops of the chicken and tomatoes have turned a golden brown. Remove from oven and let cool for 5-10 minutes before serving. 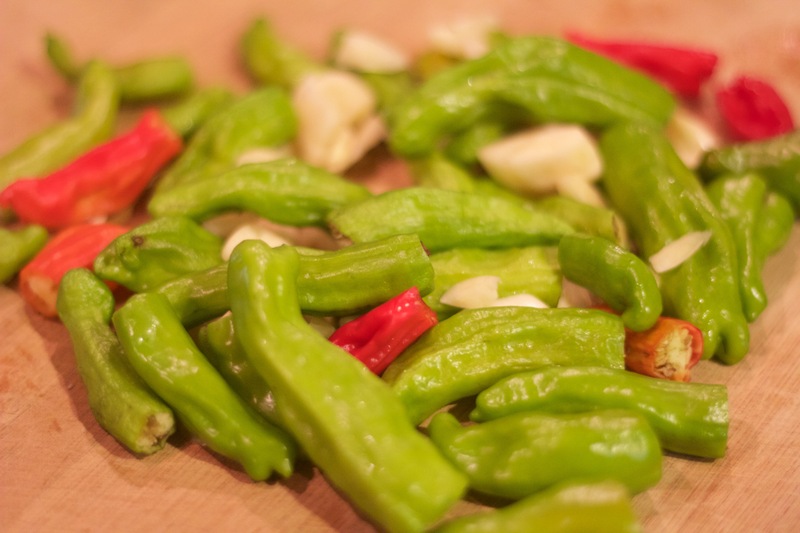 We’ve recently come to love shishito peppers. Many local Nashville restaurants have been featuring them on their menus which caught our attention. In addition to a small plant in our own raised bed garden, our lovely CSA, through Double N Urban Farm, has had a beautiful crop of them this year so we’ve enjoyed quite a few this summer and found so many fun ways to incorporate them into our meals. Below, is one of the most recent ways. Pre-heat roasting pan and add butter, peppers, garlic, and seasonings. Roast for approximately 20 minutes until peppers start to brown. Turn and shake pan occasionally. Do this while steak is grilling. When the steak is done to your liking, pull the steak off the grill to rest. Add cider vinegar and honey to peppers, mix well, and roast for a few more minutes. Slice steak across the grain and arrange on a serving platter. Mix the steak juices with the peppers and sprinkle over sliced steak. 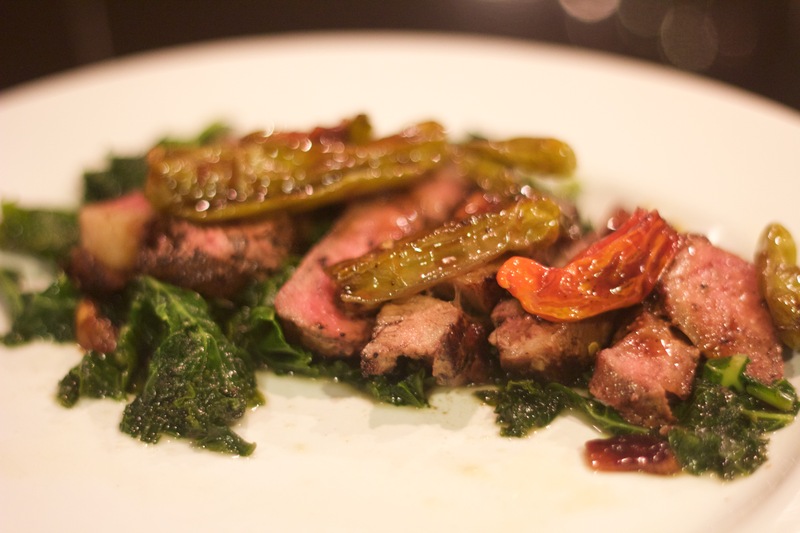 Steak with Shishito Peppers served on a bed of sautéed kale. Wine Pairing: Serve with a nice Rioja or Argentinian Malbec. 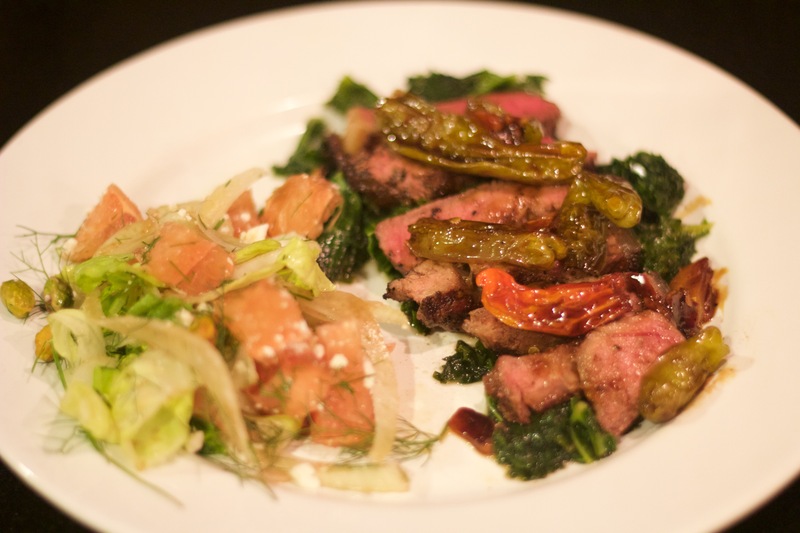 And here’s a salad I came up with to serve alongside the steak. Mix all ingredients together and toss. Add a pinch of salt and drizzle with vinegar. And, since these are mostly Grant’s recipes, I must include a new favorite bluegrass album that has been one of Grant’s favorite albums of the summer- Hot Rize’s 2014 release, “When I’m Free.” Formed in the late 1970’s, Hot Rize got it’s name from the leavening ingredient found in Martha White flour, a common sponsor of the old country shows way back in the day. 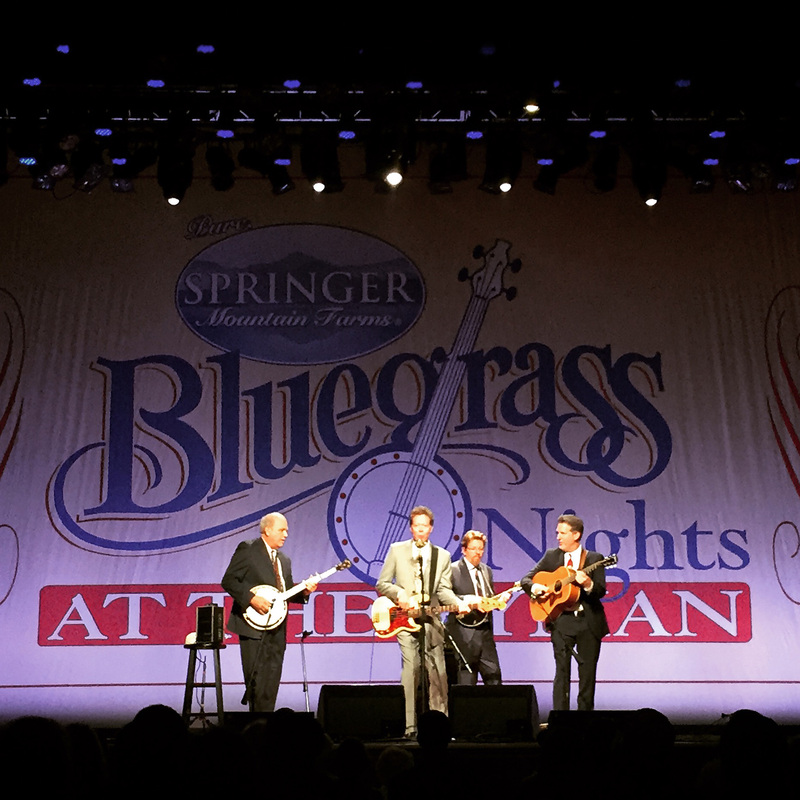 We were lucky to have the opportunity to see Hot Rize back in July at the Ryman Auditorium for their special Thursday night Bluegrass Jam series. These talented A-list performers (individually and together as a band) put on quite a show. Hot Rize, Ryman Auditorium. July, 2015. Be sure to check out this album, if you haven’t. It’s a good one! It’s been awhile since I posted any new recipes here. We’ve been making lots of old favorite summer recipes mostly. 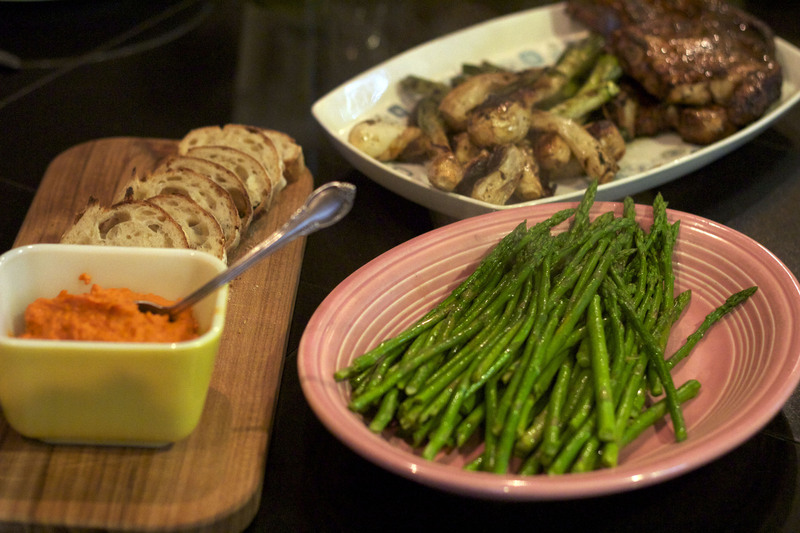 We make homemade Romesco at the first sign of asparagus and spring onions! 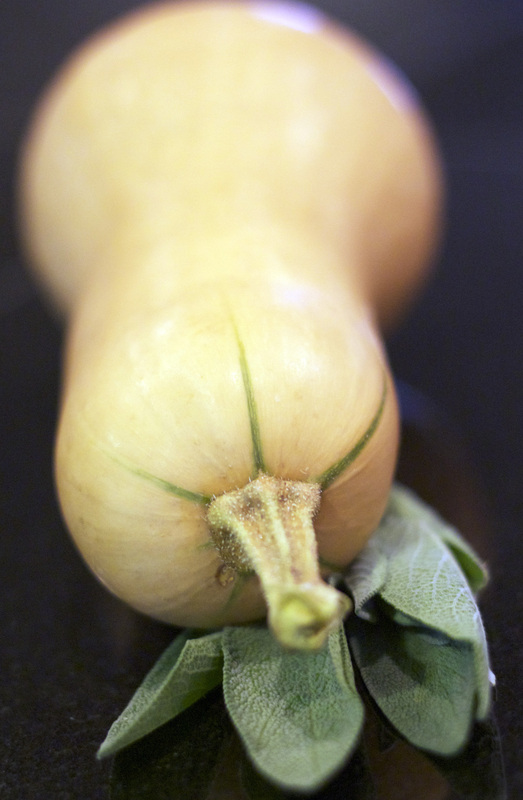 At the first sign of yellow crookneck squash, I start dreaming about this wonderful Buttermilk Squash Soup recipe from 101 Cookbooks. 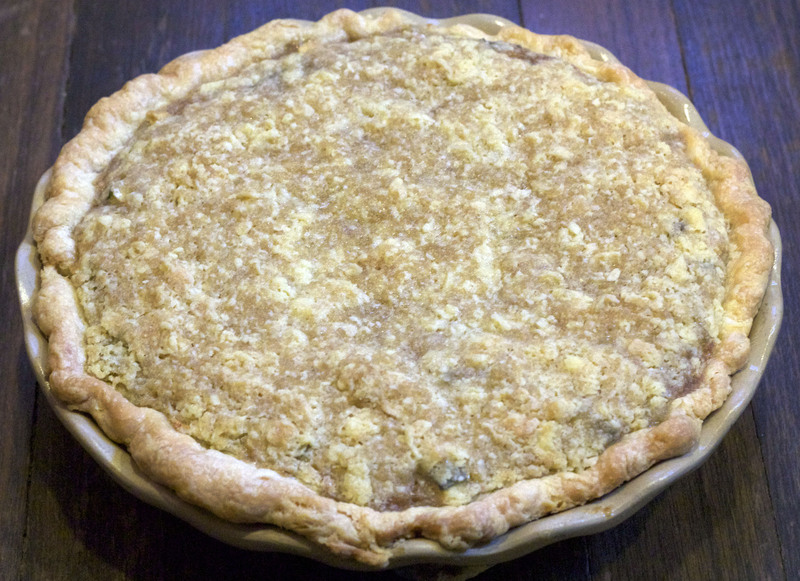 And last week, we had enough tomatoes from our Double N Urban Farm CSA to make a Tomato Crumble Pie. I look forward to both of these every summer. A few weeks back, we had lots of beautiful varieties of kale in our CSA basket and came up with this lovely variation of a Kale Caesar. To make the seed brittle, use an iron skillet. Place seeds in skillet on medium heat. Once they start to get warm and slightly toasty, pour in maple syrup. Stir and add chili powder and a pinch of salt. Remove from heat and let cool on a plate. Wash kale leaves well, dry, and remove the middle, thick vein. Tear leaves into bite sized pieces and place in a big bowl. 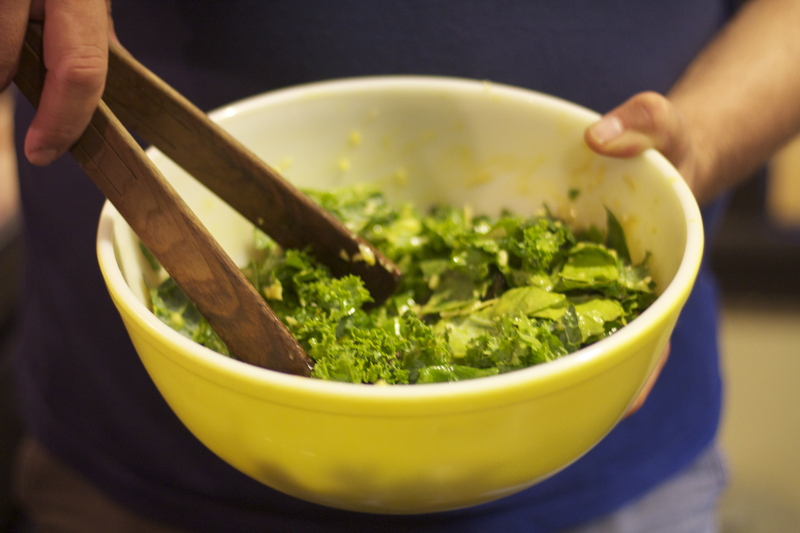 To make dressing- in a small bowl, mix the garlic, mustard, Worcestershire, egg, and olive oil with a small whisk. Slowly pour the olive oil in as you whisk. Pour dressing over kale leaves. Pour cheese in and gently toss. Top with seed brittle. Divide between two plates and serve with a lemon wedge. 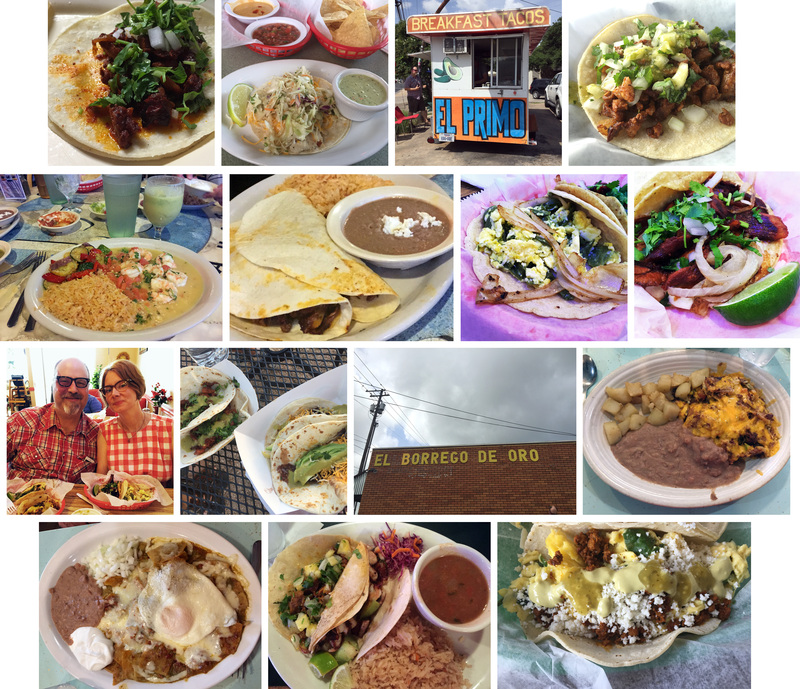 And then we went to Austin where it has become our tradition to eat as many tacos as is possible! 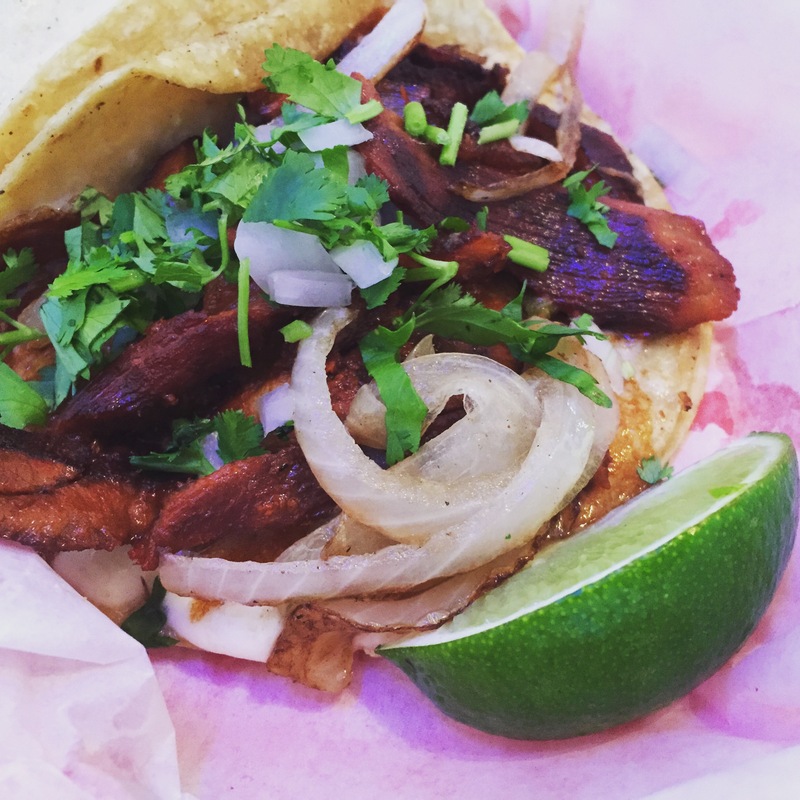 We tried lots of new places to us but our very favorite new taco was the “Gringa” from Rosita’s Al Pastor on East Riverside Drive. It was divine! In fact, I’ve been day dreaming about it ever since. Grant played a gig with our friend and talented songwriter, Teri Joyce. I love seeing music in Texas because the room is always full of dancers! Grant playing with Teri Joyce & The Tagalongs at ABGB in Austin. 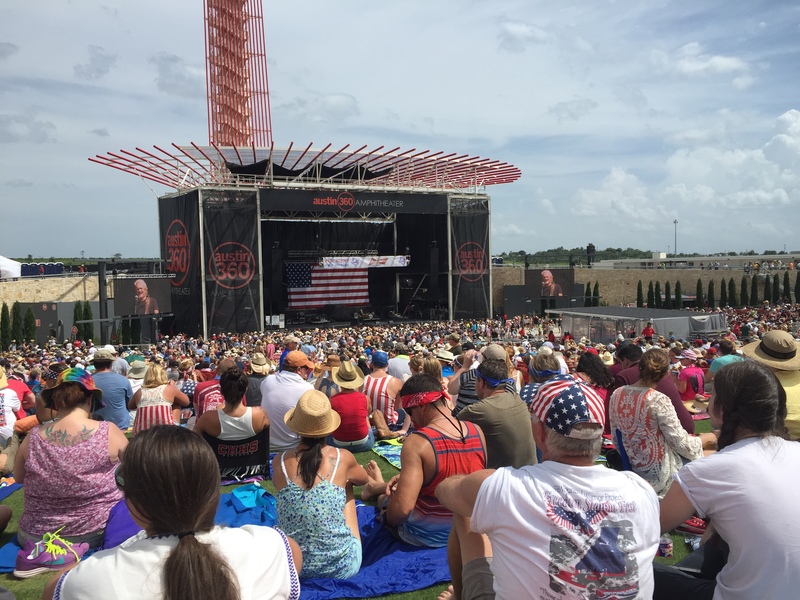 We also finally experienced Willie’s Picnic on the 4th of July which was super fun. I’ve never been much of a festival fan but I am happy to report that Willie’s Picnic was very well organized, all the bands put on great performances, and it was an all around fun day. 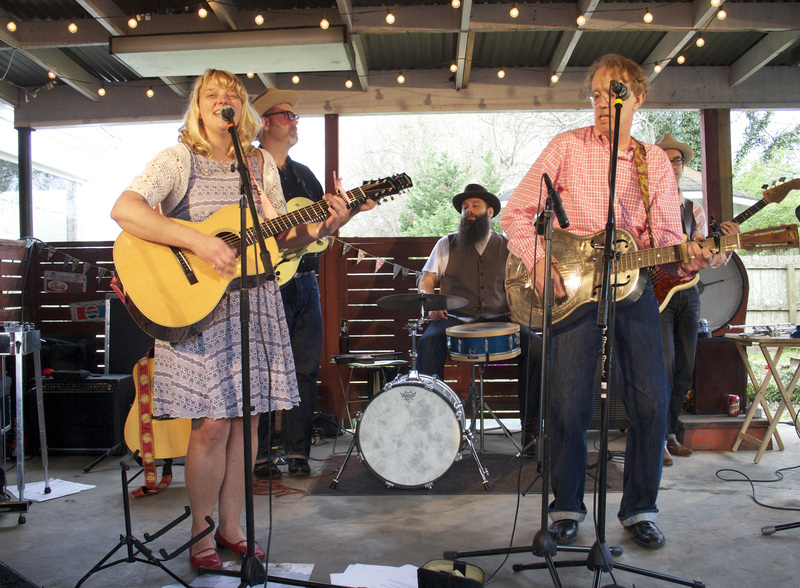 It was a great mix of our favorite Texas and Nashville bands. 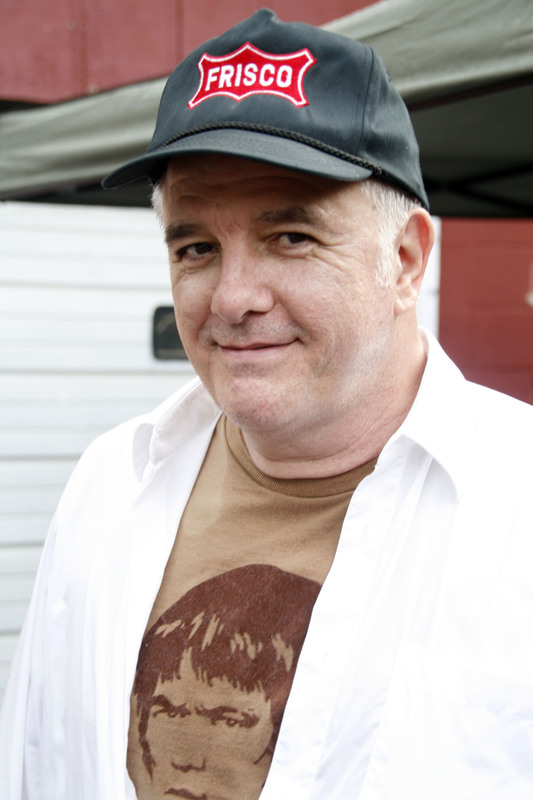 You can read/hear a fabulous interview with Chris that our friend Jewly Hight did for NPR here. Traveller is one of my new favorite albums. It’s pure country soul. You can purchase the new album here. I was super excited to see that Samantha Harlow has a new video out! You can see it and read so much about her in this fun Rolling Stone Country article here. We’ve known Samantha since Grant played down at Robert’s. She tends bar and often jumps up on stage to sing a song or two. She has such a lovely voice. Keep an eye on this one, I think she has a bright future. 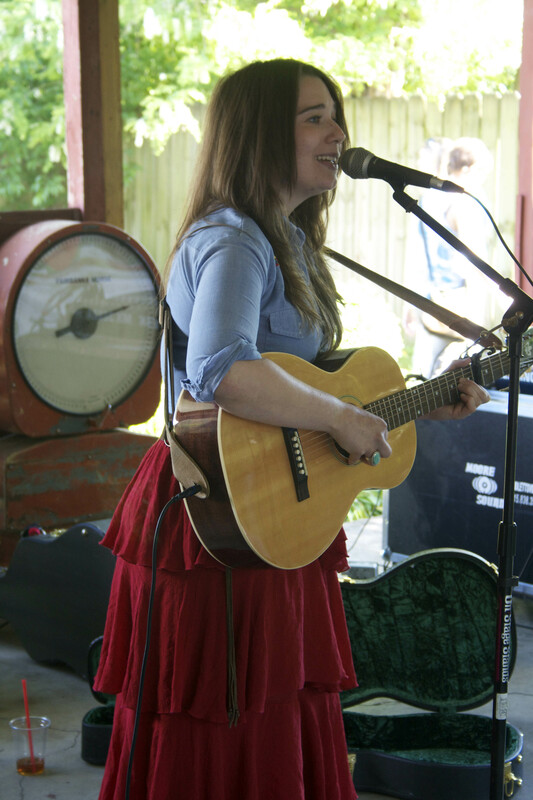 Samantha Harlow played our Red Barn Round-Up party way back when… May, 2013. 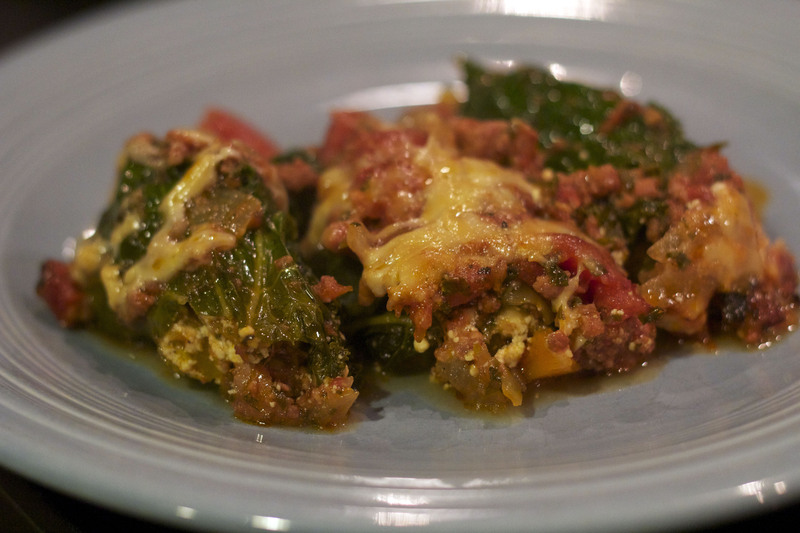 Stuffed Kale- Oooey Gooey Cheesey Goodness! There is some prep involved but you can do these individual steps ahead of time and then assemble them all together before baking. The ricotta mixture looks like this! Any red sauce will do and you can leave it vegetarian if you wish. 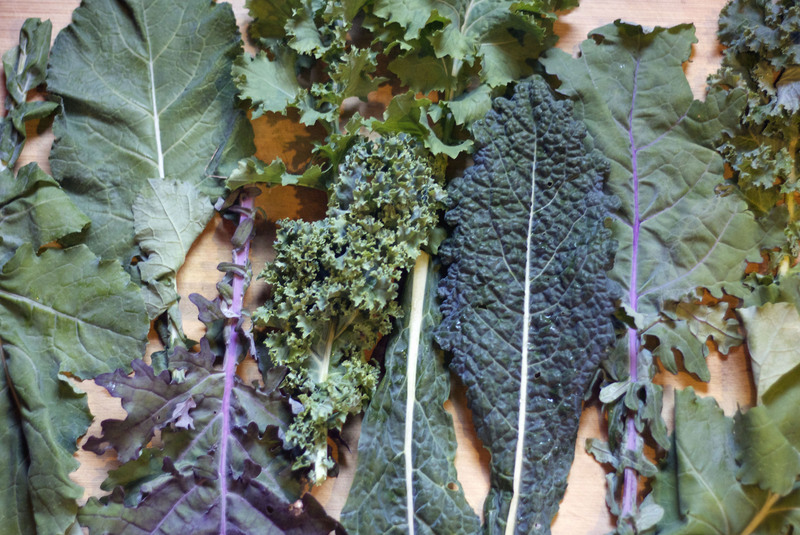 Wash the kale leaves and remove the thick center stem. So, if you have big leaves, you can use each half as a leaf. Pat them dry and set aside. Saute the onion and butternut squash in the olive oil until soft. Set aside to cool. In a small bowl, mix together the ricotta, herbs, salt and pepper. 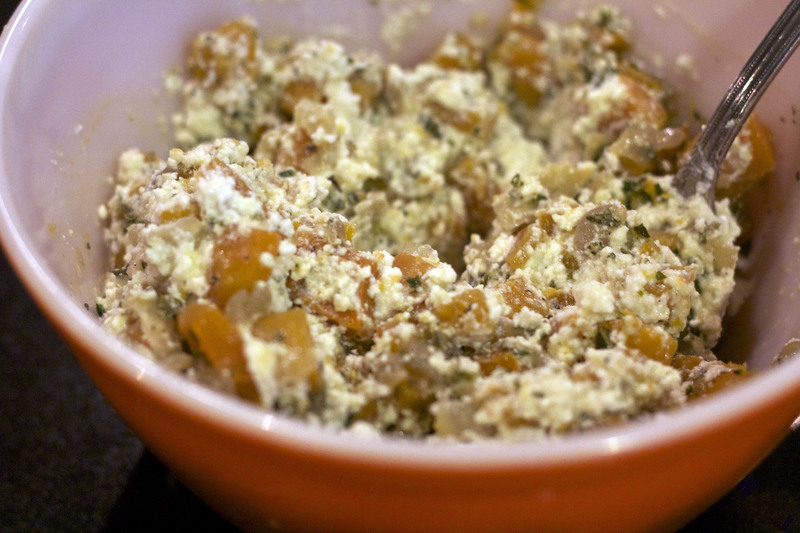 Once the onion and squash mixture is cool, mix it with the ricotta. 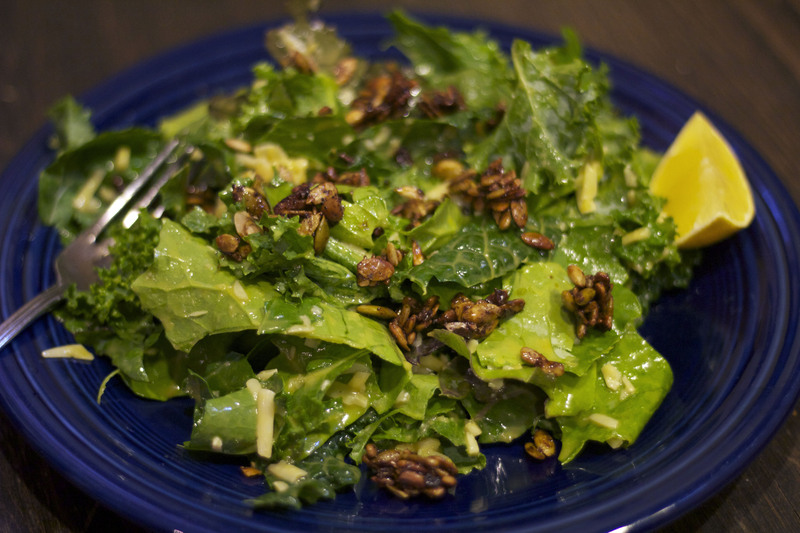 Use the kale leaf as a pasta shell and stuff it full! Preheat oven to 375. Place a thin layer of the sauce in the bottom of a 9”x13” baking dish. 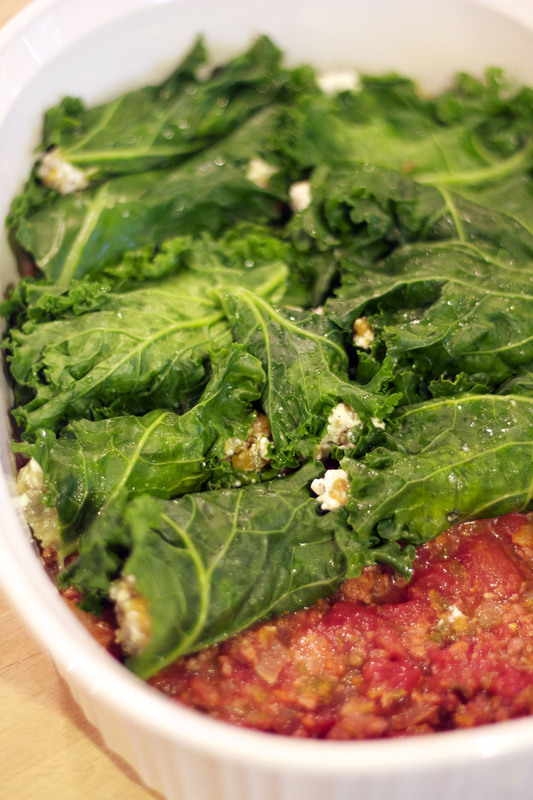 Hold a kale leaf in your hand and place a spoonful of the ricotta mixture on it. 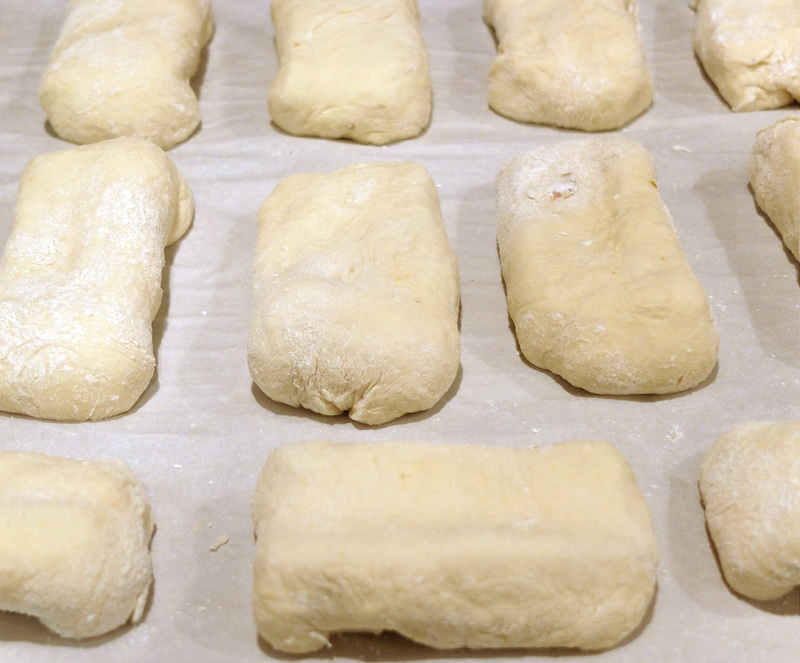 Roll to tuck the sides under and place in the baking dish. 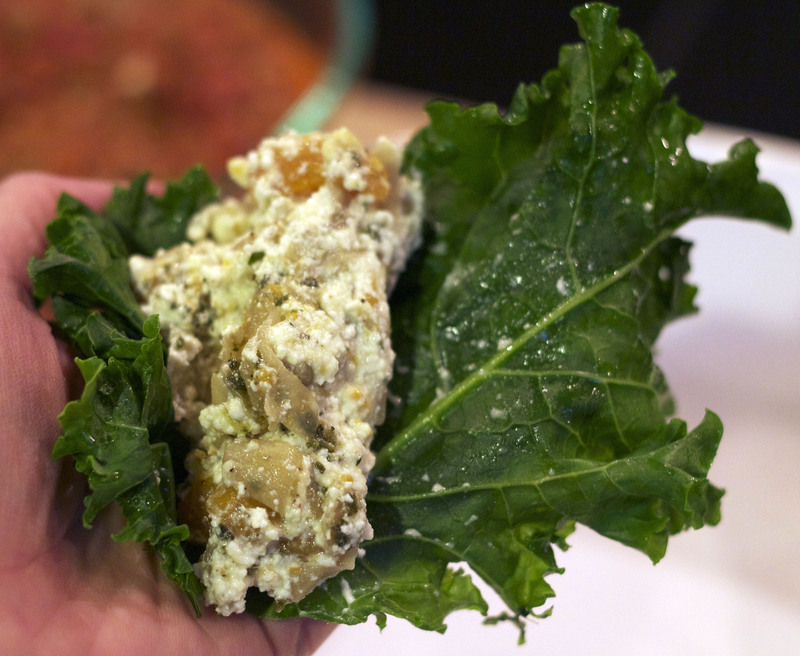 (Basically, you use the kale leaves as you would pasta- as a vessel to hold the ricotta filling.) Repeat until all the kale bundles have been made and the dish is full with one layer of tightly bunched kale bundles. Cover with the sauce. Top with the grated cheese. Bake for about 45 minutes, or until the top is a nice golden brown. When we lived in Seattle, one of my favorite places to shop was the PCC Markets. They brought natural food shopping to all new heights. One thing I still look forward to each time we visit and get together with family and friends is stopping by for some party or picnic foods. In addition to an enormous selection of local cheeses, breads, produce, beer, wine, and chocolates, they also have a great deli filled with delicious and healthy prepared foods. 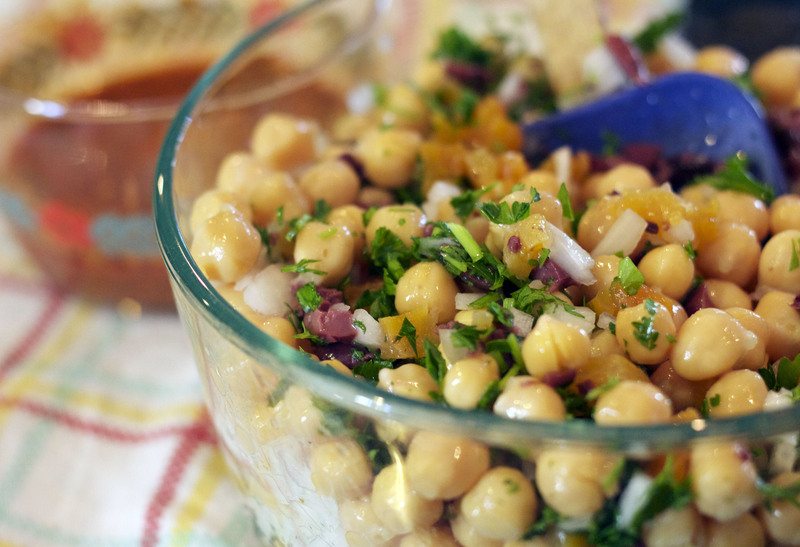 This next recipe is one I adapted from their recipe called, Turkish Garbanzo Salad. I just made a few adjustments to better fit my taste- one is, I changed to Spanish smoked paprika which gives it a much different flavor. I don’t like it quite so onion-y so I held back on the onion and switched to a white onion. I also adjusted the amounts of each ingredient to make a smaller quantity. I love it but if I make too much, we have too many leftovers. If you are making it for a large group or taking it to a potluck, you may want to double this recipe. This one makes about 6 or so servings. 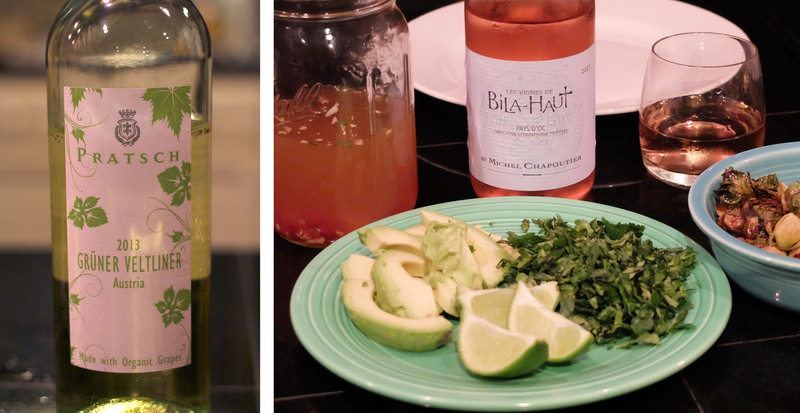 Mix the first 9 ingredients together in a small bowl to make a vinaigrette. In a medium sized bowl, add the beans, onion, apricots, and olives. Stir well. Pour the vinaigrette over the bean mixture and stir. Let set in the refrigerator for a couple of hours before serving. I make the Garbanzo Bean Salad so often that I wanted to come up with another fun and healthy bean salad for more variety. Bean salads are perfect for lunch- they are so simple to make, you can make them super healthy, you can eat them without having to heat them, and they offer a good protein hit to sustain you throughout the afternoon. 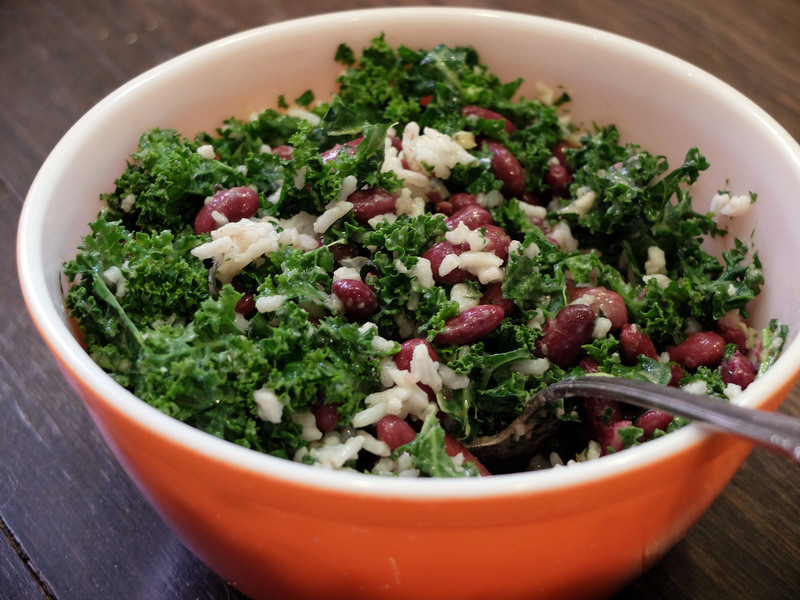 This next one is a beans and kale salad which came about based on what I had in the refrigerator and in my cupboard. As I began to add ingredients together, it started to remind me of my favorite dish at The Wild Cow vegetarian restaurant in Nashville, Beans & Greens, hence the name of this salad. 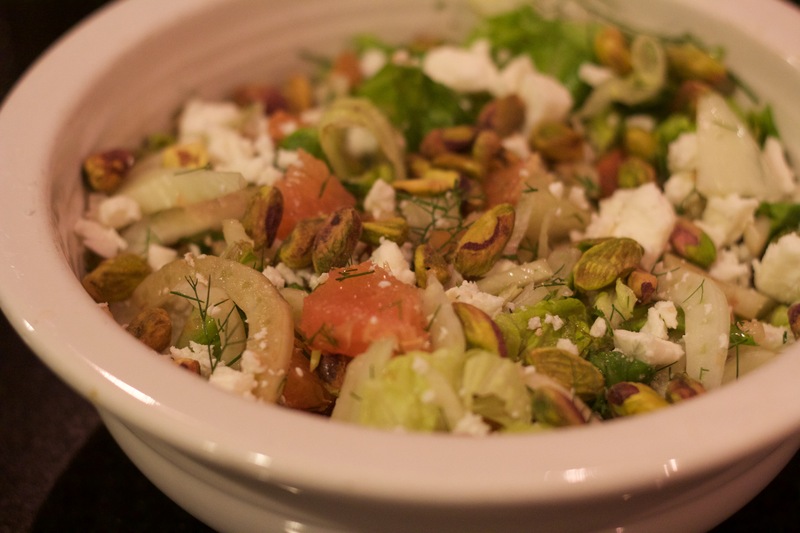 Make a dressing by mixing the first 6 ingredients together in a medium sized bowl. Add the kale and massage it into the dressing, gently crushing the leaves a little. Add in the beans and rice and stir. 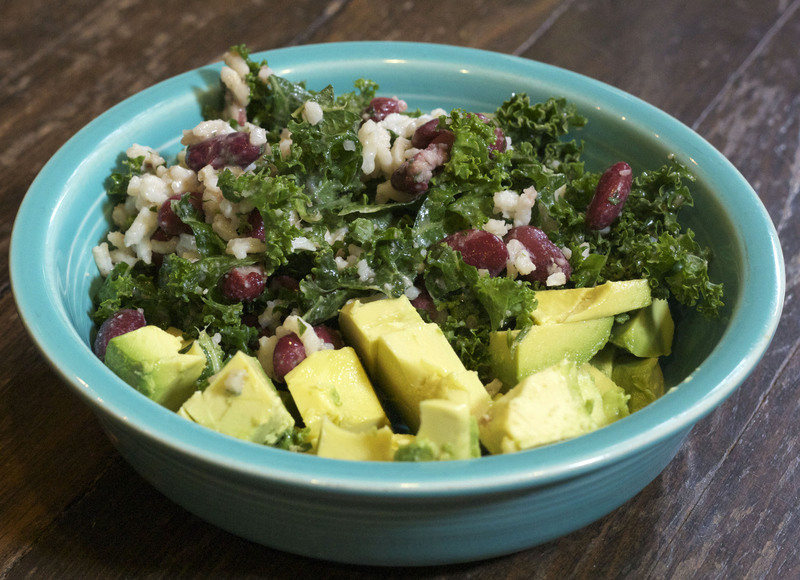 Add sliced avocado on the side for an even more deliciously satisfying lunch! New music and record release shows are happening in our neighborhood on a daily basis. We can hardly keep up but it sure is fun trying! 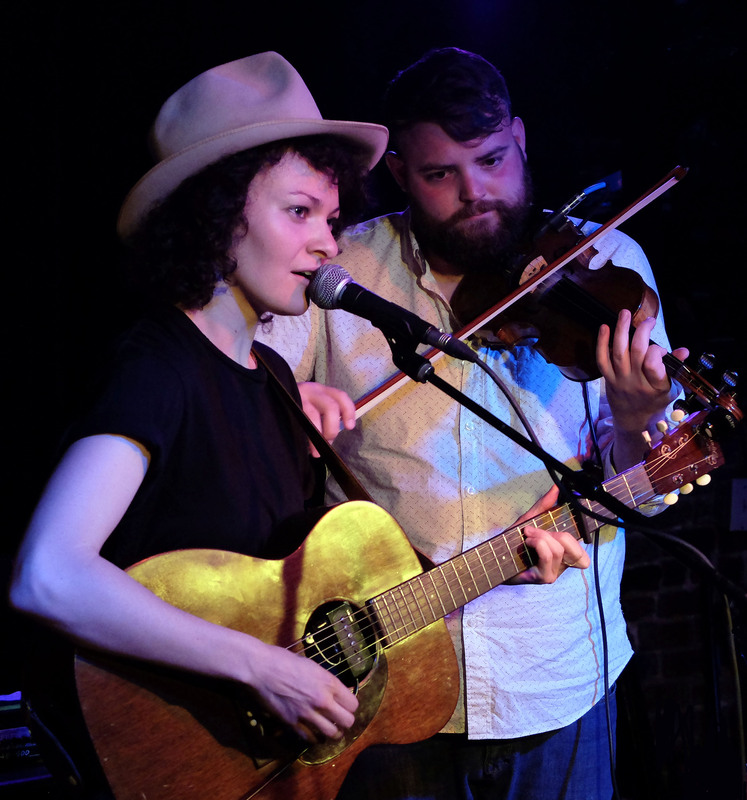 I had seen Jesse Lafser play awhile back and remembered really loving her voice so when I saw her post about her new release party, I knew it was a must-see. 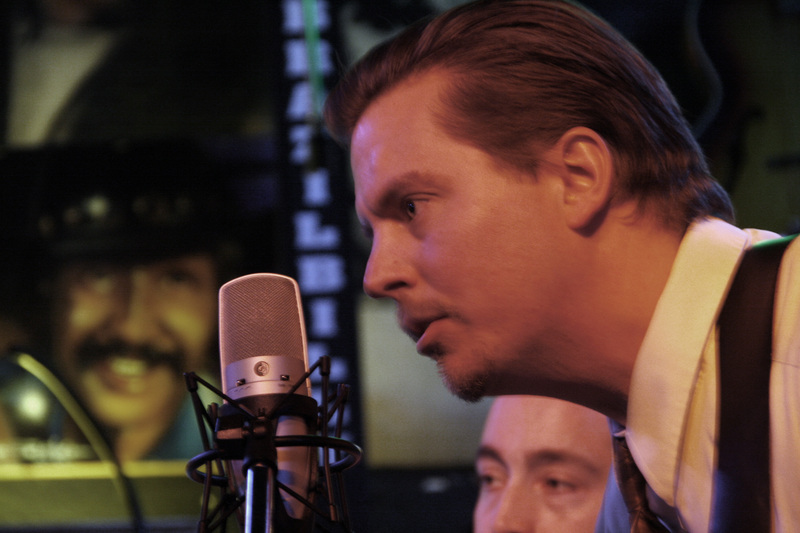 Jesse Lafser at the Basement, April 25, 2015. Even Rolling Stone is talking about her! 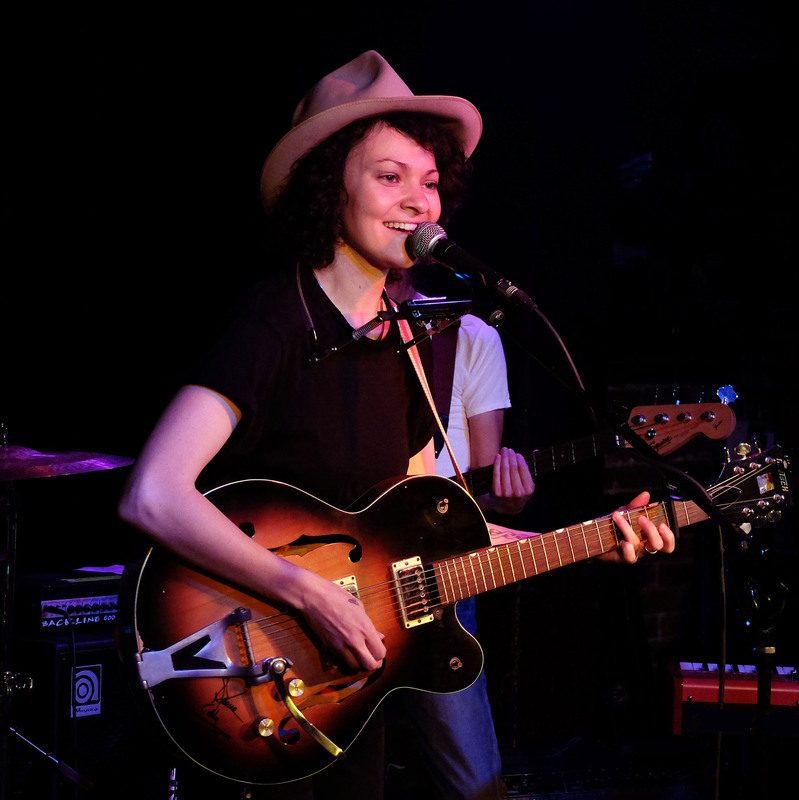 She put on one fine show at the Basement and now, her new cd is on heavy rotation in our house. My very favorite way to enjoy it, though, is played loudly, on repeat, as I drive. This is perfect road trip music. If you aren’t listening to it loudly, while hitting the road, it will surely make you want to plan your next adventure. You can read the Rolling Stone article HERE and see the video for my favorite new song. And please go buy a copy of her new cd, Raised On The Plains, HERE! 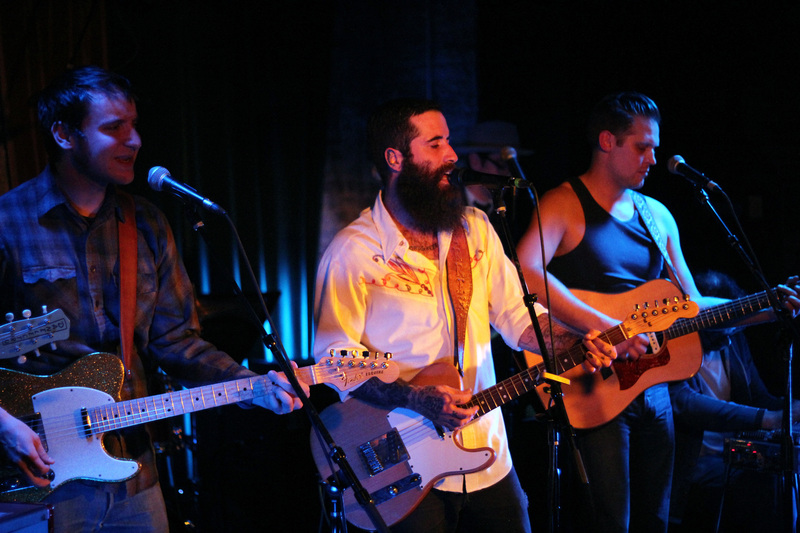 Jesse Lafser with fiddler at the Basement, April 25, 2015. 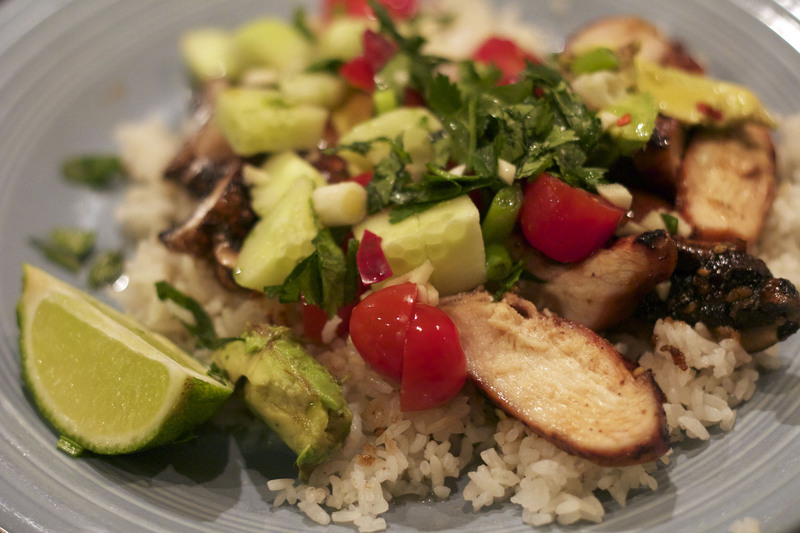 Thanks to our friends Sarah & Preston, we have a new favorite weekly dinner staple which we call Vietnamese Rice Salad. 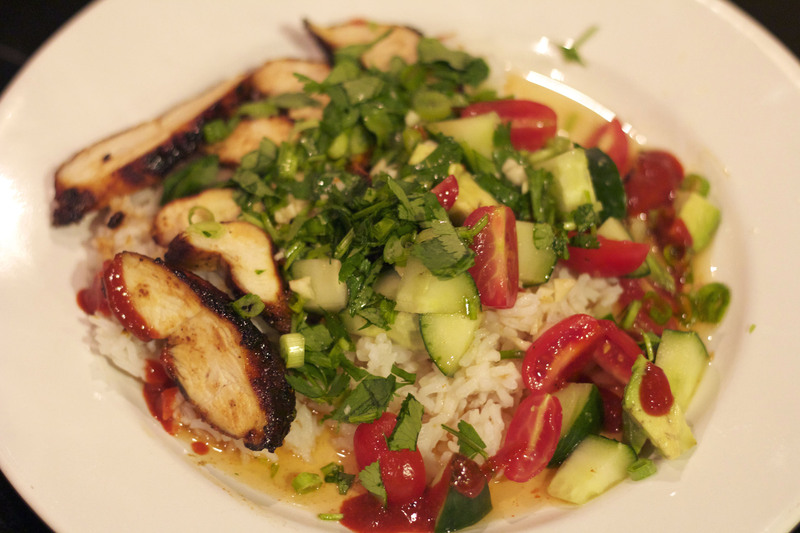 Sarah and Preston had us over to dinner a couple months ago and served us this wonderful dinner of grilled chicken and jalapenos served over rice with fresh raw vegetables and this delicious homemade Vietnamese sauce (Nuoc Mam Cham). We left their house with our bellies full and the recipe in our hands and have literally made it about half a dozen times since. It is so easy to make and lends itself to many different variations so we never tire of it. You can make it with grilled vegetables, any type of grilled meat, or Tofu. And leftovers are great the next day for lunch! With Sarah and Preston’s permission, I want to share the recipe here. The sauce is based on one of our favorite Vietnamese dishes- Bun Bowl- and Preston tried many different recipes he found before settling on this excellent version. This one is adapted from this recipe here. Mix the coconut water, vinegar, and sugar in a saucepan and bring to a boil. Remove pan from heat and let cool. Add fish sauce, lime juice, and garlic. Store the sauce in a jar in the refrigerator until ready to use. For the salad, grill vegetables and/or meat- we vary it every time. 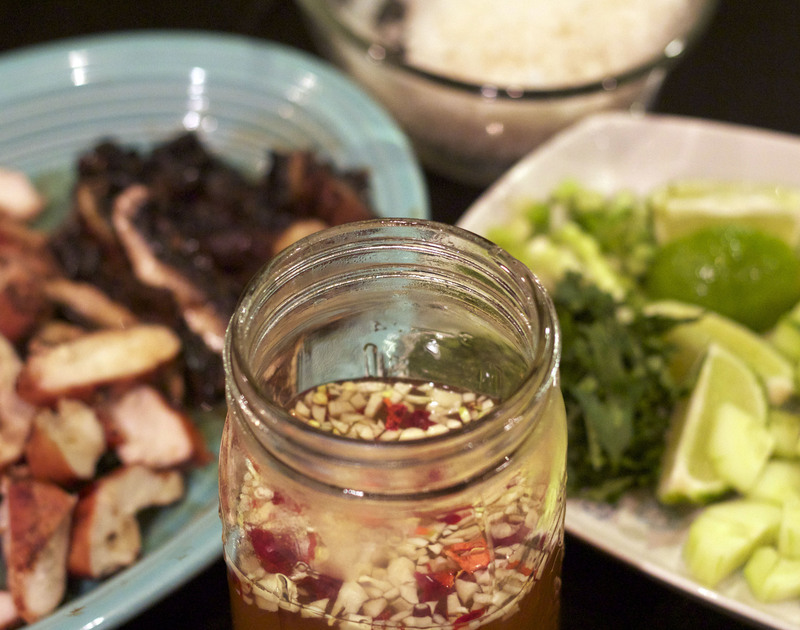 Sometimes we marinate chicken or fish in a teriyaki sauce or rub it with a simple dry rub before grilling. Grilled or pan seared shrimp is yummy. Portabello mushrooms drizzled with sesame oil and Tamari (or soy sauce) before grilling are also great. Also, grilled peppers, squash, and asparagus work well. 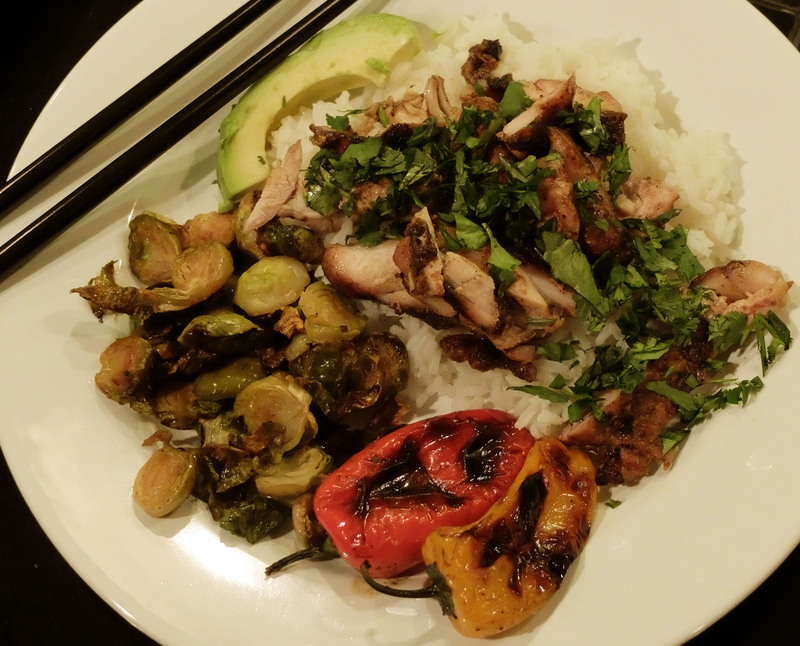 One variation also included roasted Brussels Sprouts with the rice and grilled meal. 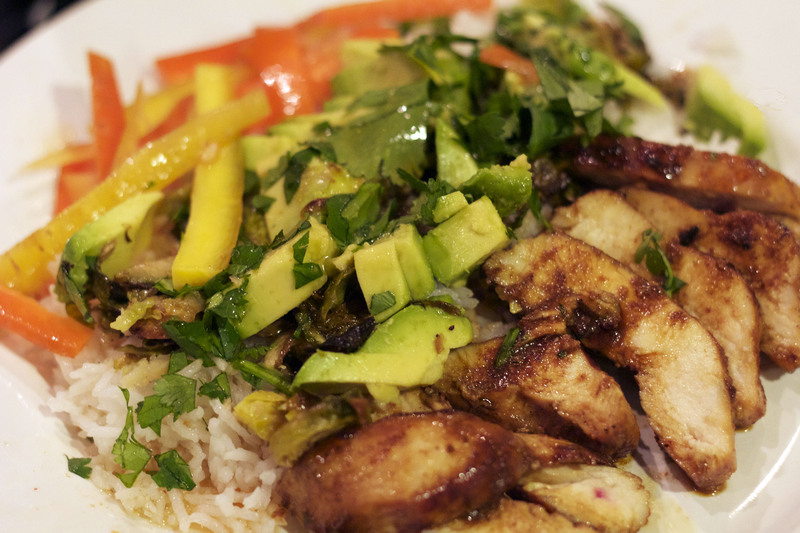 Remove meat and vegetables from the grill, chop, serve on a bed of rice, and then top with chopped tomatoes, matchstick carrot sticks, sliced avocados, chopped cilantro, chopped cucumbers, etc. Pour some of the sauce on top. Enjoy! Both these wines, above, that Grant picked out were strong pairings and are good, affordable choices for spring. We are also very thankful for Sarah in providing us with some of our favorite new music! She has a brand new album out called, Tennessee Love Song. 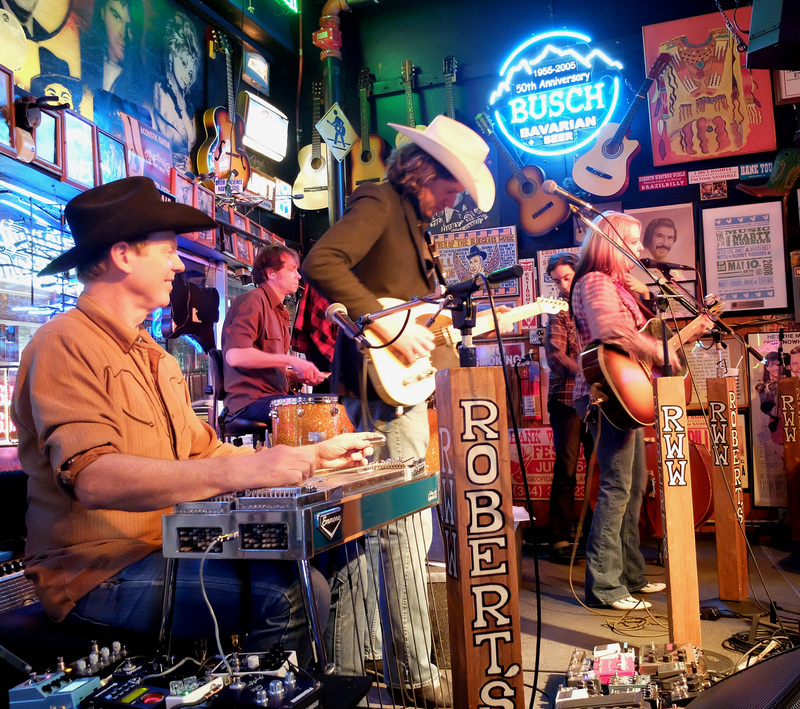 The Nashville album release is this Tuesday, April 7th at the Nashville Palace 7:30-8:30. 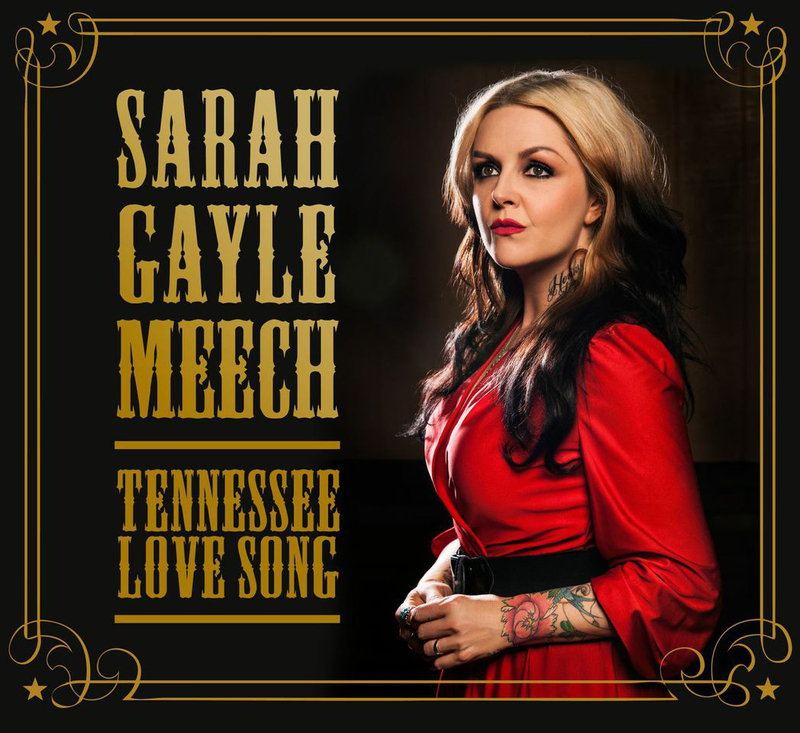 This is Sarah Gayle Meech‘s second full length release. 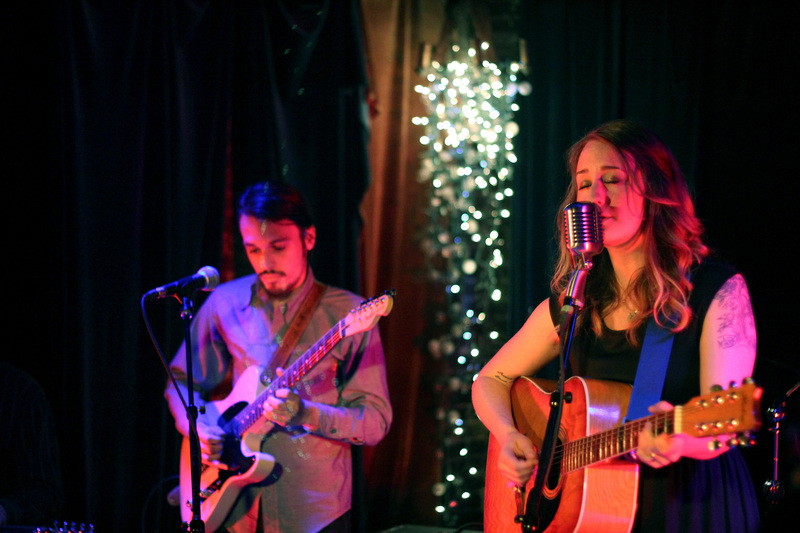 Sarah and Preston moved here about five years ago and she quickly began getting gigs playing on Lower Broadway. Grant played guitar for her for a couple of years and often I would hang out downtown watching their entire 4 hour set. Sarah is a great band leader who can work the crowd. She knows those old country classics and can very seamlessly throw her originals into the mix. 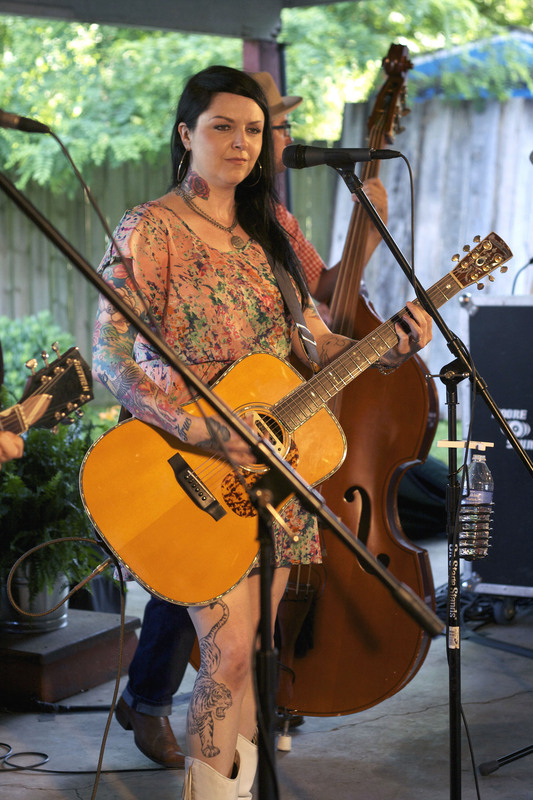 She still plays regularly at Robert’s, Layla’s, and the Nashville Palace and has been touring lots lately, as well. Sarah released her first cd a couple years ago. This second release is a great follow up. Listening to it, I can hear real confidence in her songwriting and her voice. And it is about real love songs- about place and person. There are also some really fun tunes that make me want to dance, like Watermelon and Root Beer. Below is the awesome video. It’s been awhile since I’ve seen an entire Sarah Gayle Meech set of originals so I am really looking forward to her show this week. Hope to see you there! You can purchase her new cd there or HERE. I just returned from a family visit in South Carolina where we celebrated my wonderful mother and step-father during the week marking their 25th wedding anniversary and his 80th birthday, where we were surrounded by so many dear old family friends. It made me very nostalgic and thankful for a small loving community that nurtured me as I grew up. In fact, it wasn’t until the moment I was surrounded by these beautiful friends of my parents, some of whom I have known my whole life, that I even realized how really special it was to have had this opportunity and how incredible it is to have these connections that hold so many of my memories and link special family life moments together. I am especially thankful for Mom’s 55 year old friendship with Mary Bauld. Mary is her first name, Bauld her last name but I don’t know of a single person who doesn’t always call her, “Mary Bauld.” Mary Bauld and her husband Bob met Mom and Dad in West Virginia back before any of them lived in South Carolina. They became best friends and have never strayed. They are very different from each other yet have a long history and a strong bond. They live one street apart. They have shared all important life events, good times and bad, and always been there for each other. They talk a couple times a week and go bowling every Thursday morning with a women’s bowling league, always followed by lunch and grocery shopping. Mary Bauld has four children and now many grandchildren and great grandchildren. 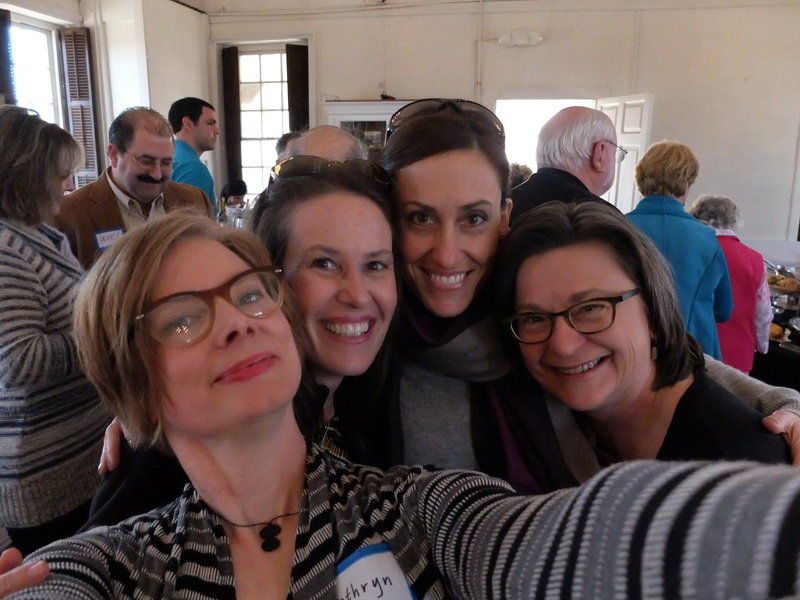 Here I am with my Sis and Janet & Barbara, Mary Bauld’s youngest girls. Growing up, I spent many hours after school and many summers hanging out at the Bauld house. Janet, the youngest of Mary Bauld’s children is two years younger than me. We learned to swim together and let me tell you, we owned that lake at the Clemson YMCA! We spent countless hours playing Barbies and watching the Bionic Woman. At my house, we became experts at furniture gymnastics and created all sorts of culinary delights as my Mom sat quietly reading in the next room, allowing us to experiment. 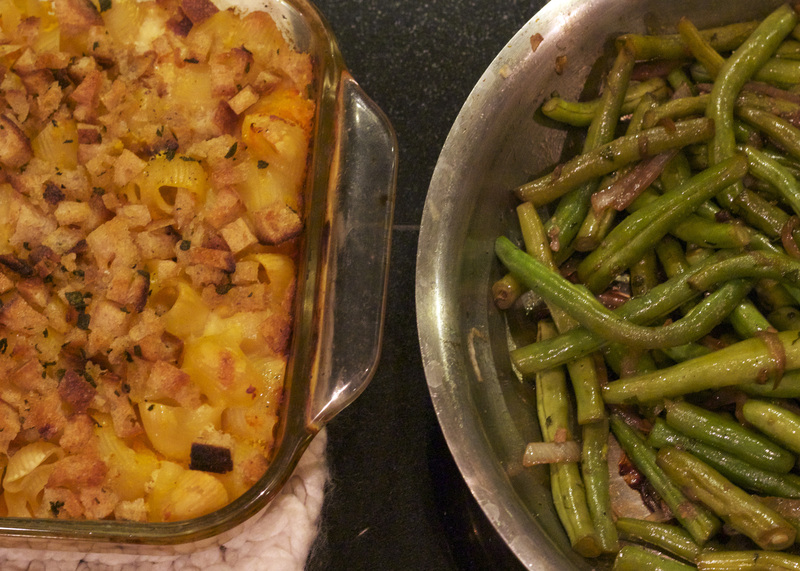 It was common to compare our mothers’ cooking- they each did things slightly different. 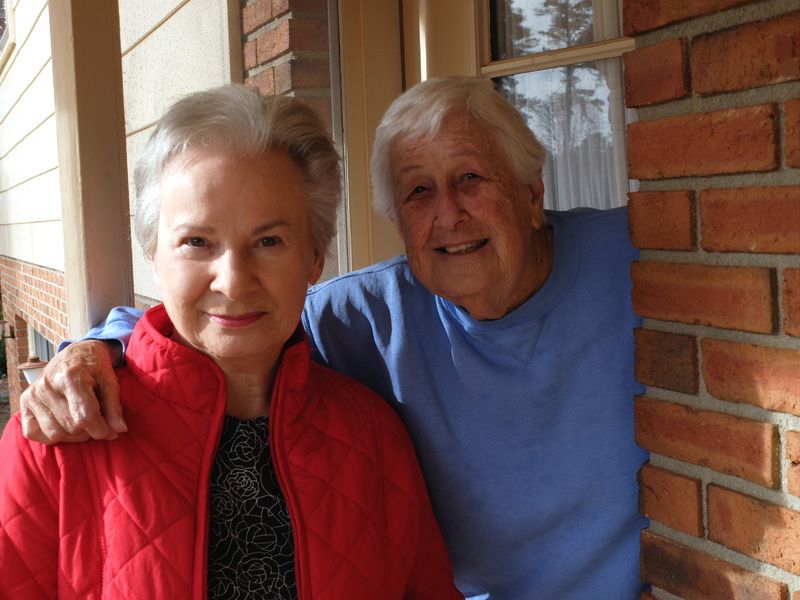 They both made delicious meatloaf- Mary Bauld always served hers with fried potatoes and Mom always served hers with Succotash. They both bragged about their sweet tea and dared us kids to say whose was better. Mom’s cooking was slightly more southern and Mary Bauld sometimes cooked up special Spanish recipes from her family such as Cabbage Rolls. One time, Mary Bauld served me a peanut butter and lettuce sandwich for lunch which was weird and I have never let her forget it. 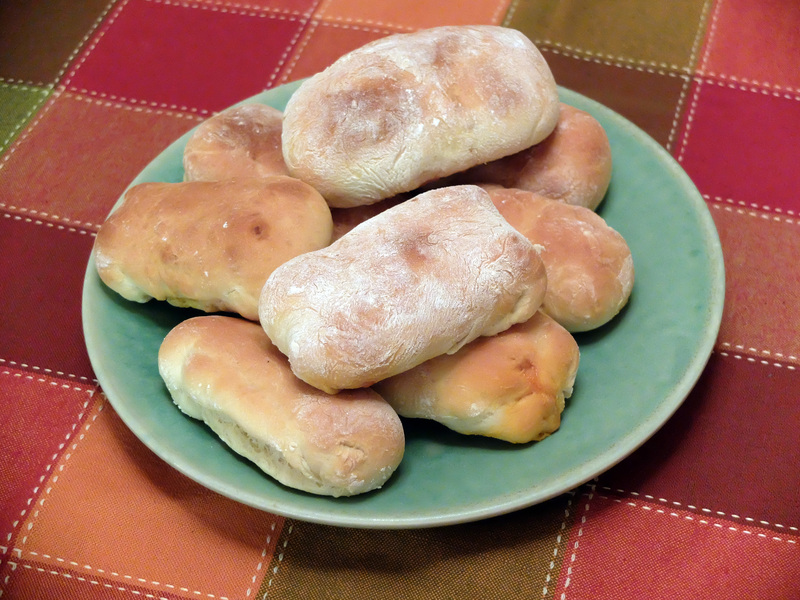 One recipe Mom learned to make from Mary Bauld was Pepperoni Rolls, a favorite from the area of West Virginia that Mary Bauld grew up in. I didn’t realize what a regional food a Pepperoni Roll was to West Virginia until a couple of years ago when I read an article about it. And I have even discovered that there is a website dedicated to the Pepperoni Roll here. Well, I grew up and stopped eating beef and got particular about all meat really. It wasn’t until we started shopping at our local Porter Road Butcher that I even really thought about eating Pepperoni Rolls again. They make their own version of pepperoni they call Porteroni from local grass-fed beef with no funny stuff in it. I had a brilliant idea to take some home with me on one of my recent visits so Mom and I could make Pepperoni Rolls together. She humored me. The instructions aren’t so clear to me and I couldn’t remember exactly how she made it all happen so I had to get some clarification from Mom and I made a minor change in my version as I don’t particularly like to use vegetable shortening (I just don’t understand it and it kind of freaks me out. ), so I substituted butter here. I think you could also use the Spectrum organic vegetable shortening or coconut oil just fine. Here is the recipe I came up with, hopefully easier to understand with a few pictures for better clarification. 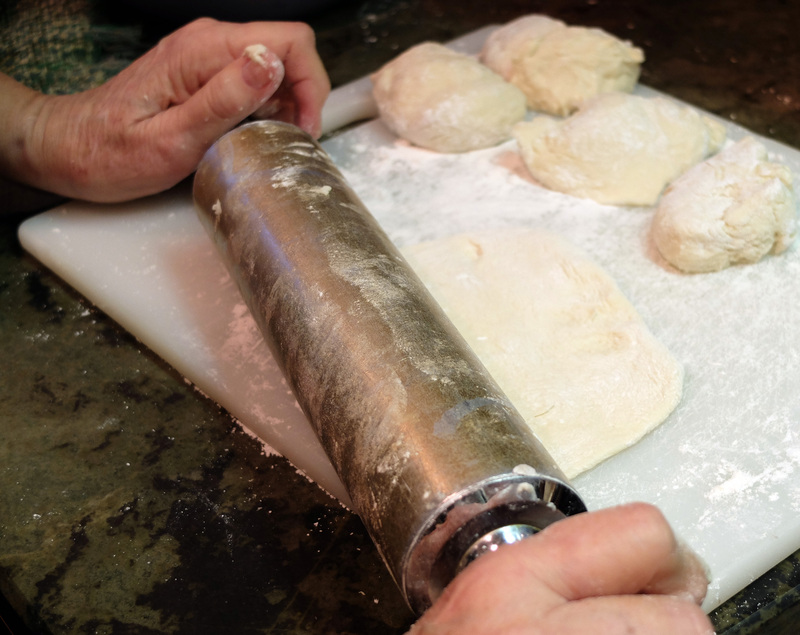 By the way, those are Mom’s hands and my Nana’s rolling pin in those photos. Place the warm water (not hot, just tepid) in a bowl and add the yeast. Dissolve the yeast. Stir in the sugar, salt, butter, and the egg. Use an electric mixer to mix gently. Add 3 cups flour to the bowl. Make sure all ingredients are incorporated. Then, stir by hand and add 3 ½ more cups flour. The dough will be sort of sticky and loose. Cover the bowl with a damp cloth (or a lid with a small hole in it) and place in refrigerator. The next day, take the bowl out and uncover. Let it come to room temperature and rise a little. After the dough rises, place the dough on a floured surface, kneading to bring together. Cut the dough into about 20-24 pieces (this recipe makes many for sharing!). Gently form each piece of dough into a ball, incorporating more flour as needed. Cut the pepperoni (or Porteroni) into strips, about 2 ½”- 3” long and ¼” wide roughly. Preheat oven to 350. Roll each ball out into a circle, about ¼” thick. Place a pepperoni stick on the round, about one third of the diameter and fold the dough over. Then place another pepperoni stick on the dough and fold over again. Tuck the ends under gently so the ends will be all sealed. Place rolls on a baking sheet and bake at 350 for approximately 20 minutes, or until golden brown and done. If you don’t eat meat or aren’t interested in Pepperoni Rolls, this recipe makes great dinner rolls, too. Mom always serves them at the holidays. 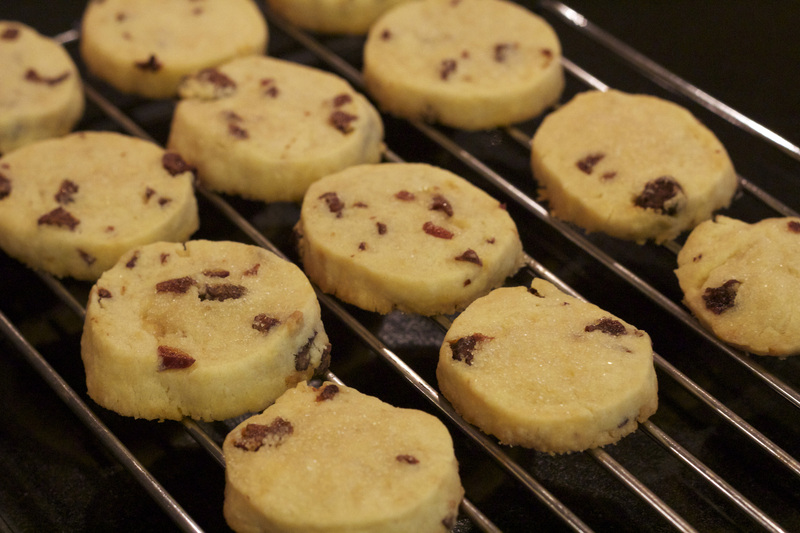 Simply use a round biscuit cutter to cut circles and then fold them over, in half, before baking. That’s the way Aunt Judy always did it. And of course, you can use any pepperoni you choose. This is not necessarily a healthier version but just one I feel better about because it was made with all real ingredients that I trusted by people I know. Sometimes, you just need to revisit those great old recipes you grew up on. And I couldn’t think of any better music to represent this post than this wonderful new release, Picnic in the Sky, from our friends Jeni and Billy because their music has been described as Appalachain Folk Music which precisely describes the music from the area where Mom and Mary Bauld grew up in the hills of Virginia and West Virginia. 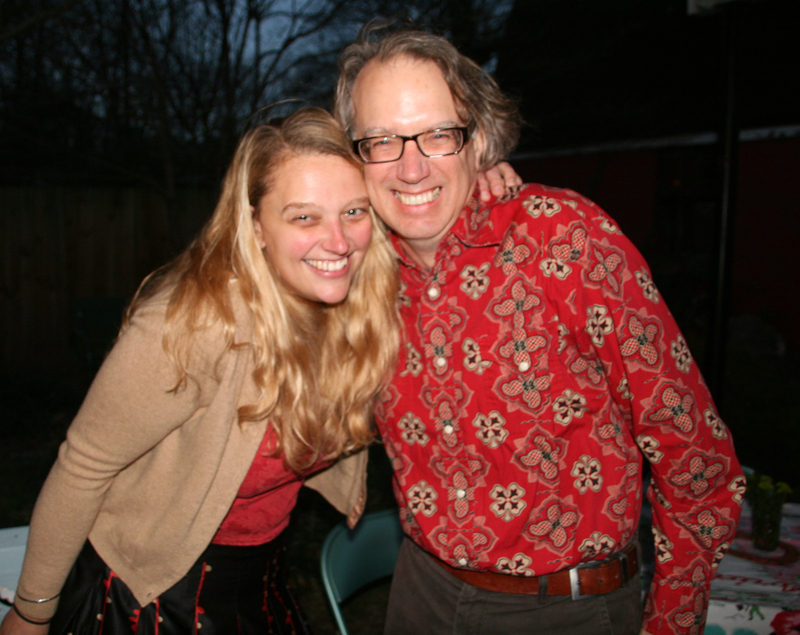 I first met Jeni and Billy at our Red Barn Round-Up parties and love running into them in the neighborhood- that is, when they happen to be home. They spend quite a lot of time working out on the road, giving house concerts and playing music festivals. You can follow their journey and read their beautiful tales on their website and blogs. 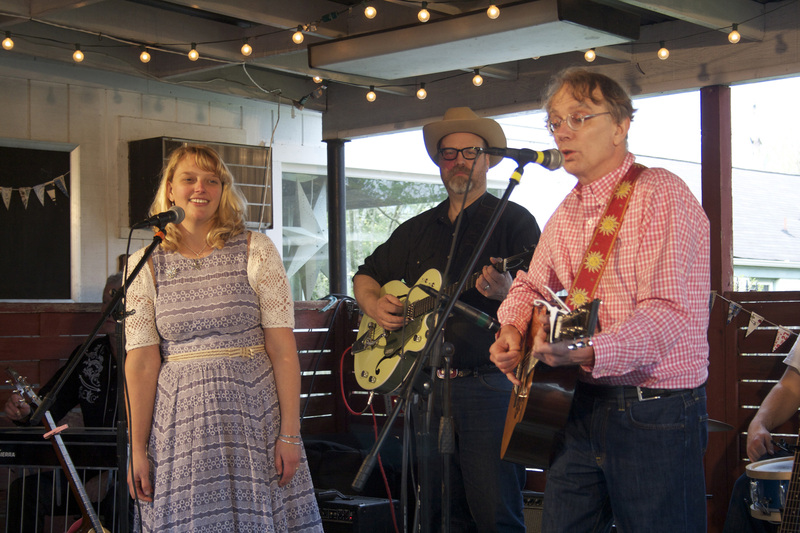 Jeni & Billy singing a duet at the Red Barn Round-Up, April 2013. Jeni & Billy with Grant playing his big green Gretsch in the backing band! Jeni and Billy are some of the sweetest, most genuine people I have ever met- in song and in real life. In fact, I went online to purchase their newest release today to listen to while I wrote this post and instantly received an email from them with the subject line, “You Wonderful Person, Thank You!” And then, I swear to God, they drove through the snow to drop off a real copy of the cd for me to have, as well. It totally made my day. So, not only will buying your own copy of their cd (here!) make you feel really special but once you listen to it you will be incredibly happy for all the new music you just added to your life and for supporting their art. Their songs are so wonderful and for me personally, bring to mind so many beautiful images of my childhood visits to Mom’s family in southwestern Virginia. I will close with this live video of Jeni & Billy performing their song, Reckoning Day. Family Portrait on Thanksgiving Day! Renewal. That’s the word that keeps popping into my head as I start this new year. 2015 has a nice ring to it, I have to admit. I just successfully made it through another holiday season. Whew… After years of working retail during the holidays and getting caught up in the extra stress often associated, I decided a couple years back that the only way to make it through is to do the very minimum when it comes to celebrating and participating in the festivities. I have worked hard at avoiding all stressful situations during this time. Lucky for us, the real meaning of the season found us anyway. With the new year, we’ve been greeted with so much love from awesome family visits, great times with old dear friends, as well as some fun new friends. I have felt that the last couple of years have been so difficult for many folks near and dear to us. We lost some dear loved ones and had more friends who were faced with scary health and life challenges. Perhaps it is our age. I have to admit that entering into my 40’s has been more challenging mentally for me than any other decade. The last few months though, I’ve been trying to regroup, alter my perspective on things, reconnect to the people and things that are most important to me, figure out some new paths, get rid of the clutter (literally and metaphorically) and I’m starting to feel a little more comfortable and excited for whatever lies ahead. One thing that becomes more clear the older I get is the love I feel for family and friends. It becomes easier to let people know how important they are to you. And throughout all these changes and challenges that life offers us as we move through this life, the constants for me that always help keep me grounded and connected to others is good food and music. I feel so grateful that I have always been able to have these two constants in my life. In keeping our distance with the holidays these past couple of years, Grant and I have used Thanksgiving as a time to try completely new recipes and ways of cooking which has been totally exciting to us. 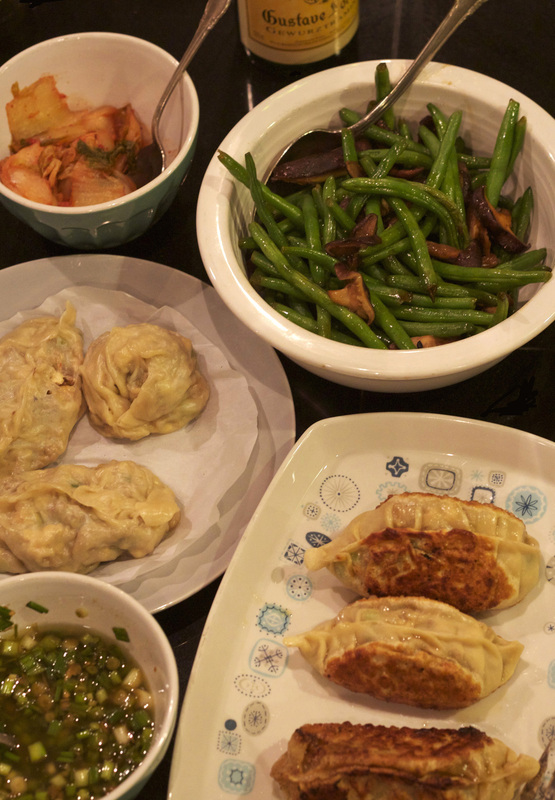 Last year, we had a Korean Thanksgiving and this past Thanksgiving, we did it again but decided to make dumplings! As we have just enjoyed the last two dumplings we had left in the freezer, I thought it was about time to post these recipes. In researching recipes before Thanksgiving, I found this wonderful website by a Korean woman who goes by the name Maangchi. I adore her. She has some great recipes and her videos are really helpful. I started out by making her recipe for dumpling wrappers and while I did this, Grant was busy working on the dumpling filling. This recipe makes 16 large wrappers, each one roughly 5 ½ to 6 inches in diameter. Combine 2 cups of flour, salt, and water in a large mixing bowl. Mix with a wooden spoon until it turns into a lump. Then knead it by hand for a few minutes until the dough gets a little softer. Put it in a plastic bag to keep it from the air and let it sit for 10 to 30 minutes on the kitchen counter. Take the dough out of the plastic bag. It will be a little softer and moist and easier to handle. Knead it for 5 to 7 minutes, until it’s smooth and elastic. Place the dough on a cutting board dusted with a bit of flour and divide it into 2 equal pieces. Put one half into the plastic bag to keep it from getting dried out as your work on the other half. Cut the piece of dough into 8 equal sized pieces. 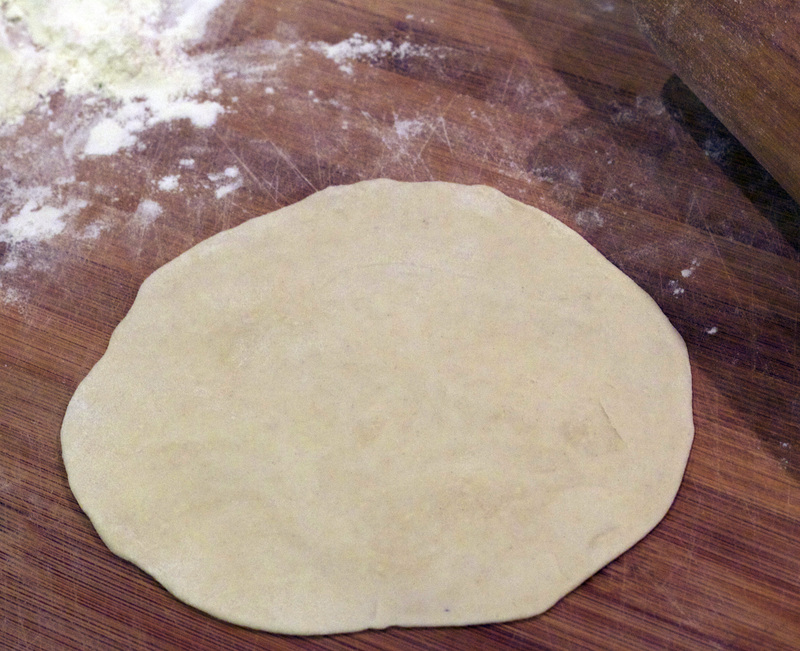 Roll each piece out with a rolling pin into 5 ½ to 6 inch round circle disks. They should be a little thinner on the edges than in the middle, because you will eventually be pinching the edges together when making the dumplings, so you don’t want them too thick and doughy. 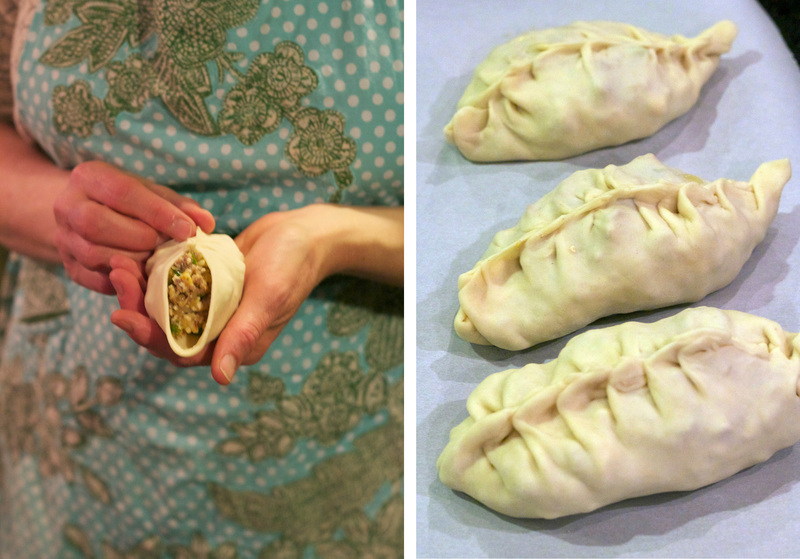 Take the second half out of the bag and make dumpling wrappers out of it using the same method. Use them right away to make dumplings, or freeze them for later. To freeze: Cover a large platter with plastic wrap and put the wrappers on it. Place them so they don’t touch each other, and separate layers of skins with sheets of plastic wrap. When it’s full of skins, cover the entire tray with plastic wrap and freeze it for up to 1 month. To use frozen Mandu-Pi, thaw out at room temperature for 10 to 20 minutes before using them to make dumplings. Makes roughly 16 large dumplings. Place the beef, pork, garlic, and ginger into a bowl. Use a wooden spoon to mix with 2 teaspoons tamari, 1 tablespoon sugar, 2 teaspoons sesame oil, and ½ teaspoon ground black pepper. You can use a food processor if you want to. 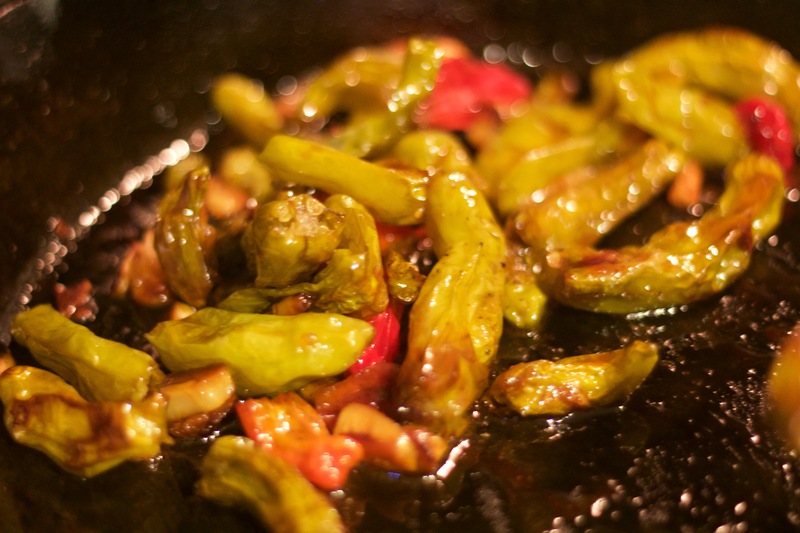 Heat up a skillet over medium high heat and add 1 teaspoon grapeseed oil. Stir fry the meat mixture until the meat is no longer pink. Transfer to a large mixing bowl and be sure to include the juices from the cooked meat. 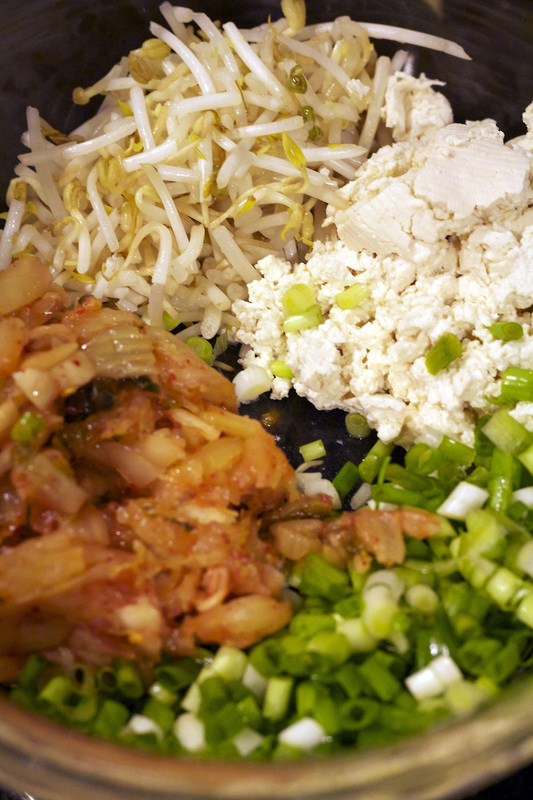 Add the minced onion, the green onions, and kimchi to the mixing bowl. Squeeze the tofu slightly by hand to remove excess water and add it to the mixing bowl. Add 1 teaspoon salt, 1 teaspoon sesame oil, ½ teaspoon ground black pepper. Mix well by hand or a wooden spoon until well mixed. Put a wrapper on your palm and add 2 or 3 spoons of filling to the center. Loosely fold it in half vertically. Pinch the bottom on the fold to seal it. Push the right side in a little bit, so the wrapper folds in on itself slightly. Pinch that fold to make a pleat. Do the same on the left side and alternate sides all the way up until the dumpling is sealed. Pinch or wrap the end to seal it. Repeat until you’ve made all dumplings. Set the dumplings on a tray lined with plastic wrap so they aren’t touching each other. Put into the freezer for 8 hours or so, until they are all frozen. Gently put them into a plastic bag or airtight container and put them back into the freezer. Boil water in a steamer. Line the steamer rack or basket with a parchment paper. Place dumplings in the steamer basket, but be sure to make room between them because they will expand slightly when cooked. Cover and steam for 15 minutes. Remove and serve with dipping sauce. Heat up a skillet over medium high heat. Add 2 tablespoons vegetable oil and swirl to spread the oil evenly. Add some dumplings and cook over medium heat, rotating them so each side gets golden-brown. Lower the heat to low and cover. Cook for a few more minutes. Remove and serve with dipping sauce. Combine 2 tablespoons of soy sauce, 1 tablespoon vinegar, ¼ cup chopped onion, jalapeño in a bowl. Mix well. Optionally, if you like it sweet, add 1 teaspoon brown sugar. 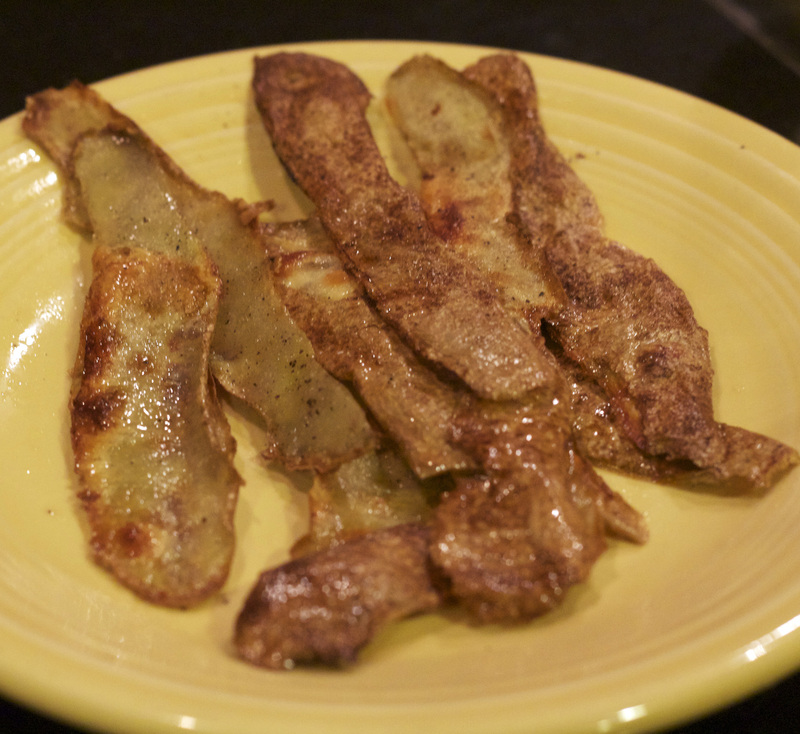 In making the mashed potatoes, Grant saved the skins and, not wanting to ever waste any food (plus, always looking for more delicious snacks), he lightly fried the skins for a little pre-meal appetizer! Genius idea. We made a few fried dumplings and a few steamed. I think the steamed ones were my favorite! 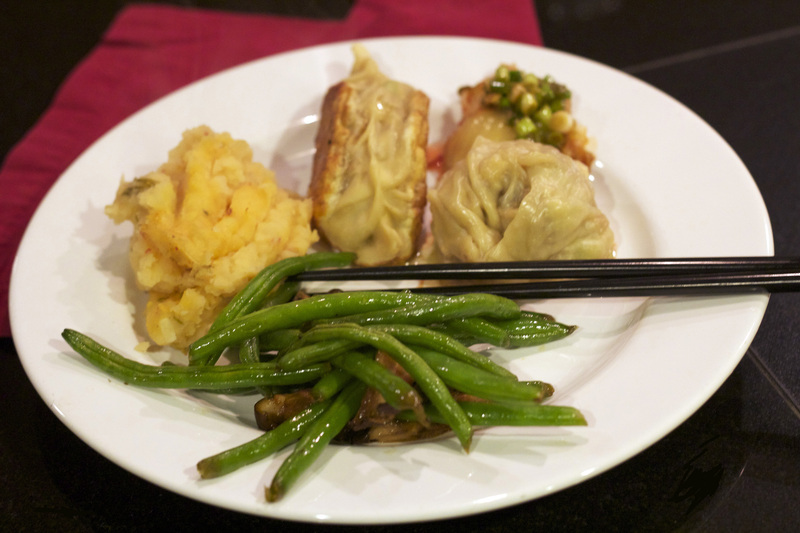 We served the dumplings with green beans that had been sauteed with shiitake mushrooms and some kimchi mashed potatoes! 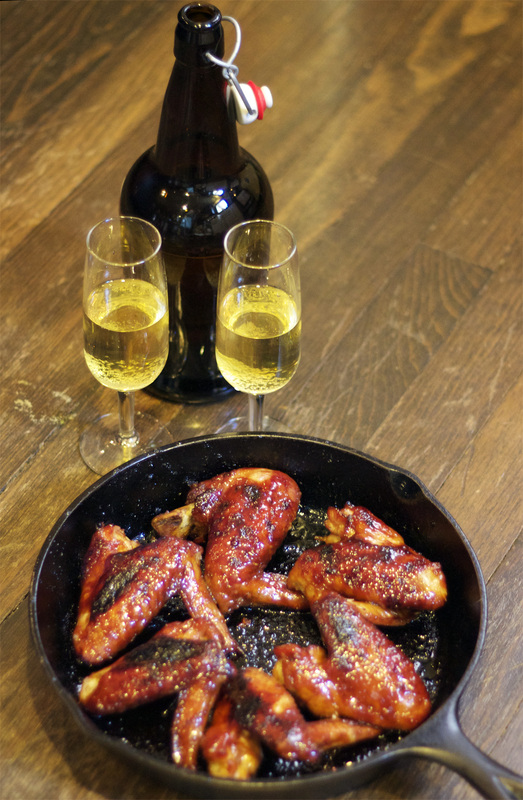 As an appetizer (it was Thanksgiving after all), Grant made these yummy chicken wings that he threw together. We enjoyed these with some delicious homemade cider our friend David made for us. Preheat oven to 400. Combine all ingredients (excluding the chicken & grapeseed oil) together in a bowl. Add chicken and cover. Marinate 2 hours or overnight. Heat an iron skillet on stove on medium high. Add grapeseed oil. Take chicken out of marinade but reserve the marinade. Put the chicken wings in the pan skin side down and sear until a golden brown. Flip chicken wings over with tongs or a fork. Place skillet in the oven for 20 minutes to finish cooking. While those are cooking, heat the marinade in a saucepan over medium heat to reduce by half. Use this to baste the chicken wings a couple of times for the last 10 minutes of baking time. Remove the skillet from the oven and cool for a couple minutes. Serve! And for dessert, I made these cookies which I adapted from another shortbread recipe I came up with awhile back. Preheat oven to 325°F. Mix sugar, salt, and flour together in a bowl. Add butter. 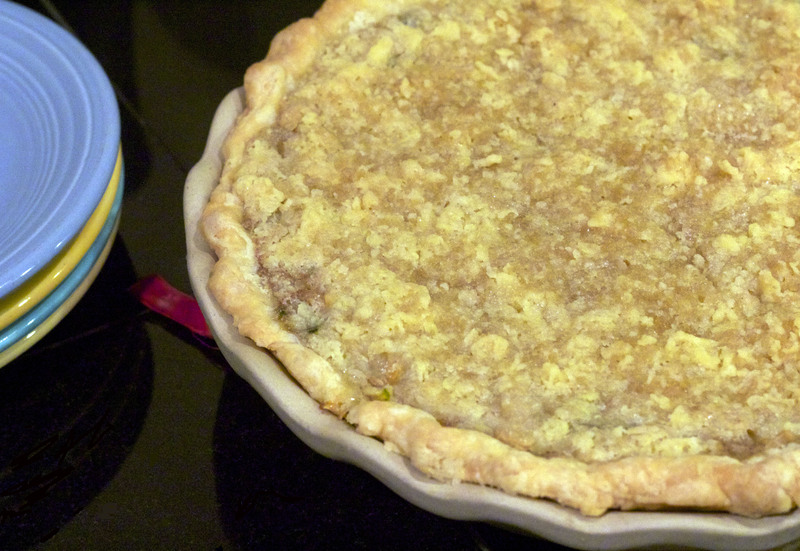 Use your finger to incorporate the butter into the flour mixture, slowly and gently like you would pie crust. The largest pieces of butter should be the size of grains of rice. Once the butter is mixed in, add raisins, ginger, and buttermilk. Mix together. Gather dough into ball, wrap in plastic and refrigerate for an hour or so. You can roll dough out and cut cookies with a cookie cutter or roll into a log and slice. Sprinkle each cookie with a little raw cane sugar. Bake cookies until lightly browned, about 20 minutes. Cool on rack. Left & Middle- Santa’s Ice Cold Pickers play at Santa’s Pub every Sunday 7-9pm. Right- Kenny Vaughan Trio playing happy hour at The 5 Spot (Jan 2015). We’ve been enjoying some fun Happy Hour shows around town and our usual weekly musical events and sincerely hope to follow through on my resolution of more live music in 2015 in the weeks to come… Happy New Year everyone! I’ve been thankful for my blog these last few weeks as it has served as a nice reminder of some of our favorite recipes and we have have been revisiting those lately. With the cold weather moving on in, we’ve already made several soups from previous posts- Lima Bean Soup With Bacon & Lemon, Simple Roasted Sweet Potato Soup, and Cabbage Soup. There are also these soups from last year that we conjure back up from time to time. And here is this year’s version of my Roasted Pumpkin Soup. I say “this year” because I make it once a year but usually forget to write it down and then have to reinvent it every year. Roasted Pumpkin Soup with a bowl of freshly chopped herbs ready to go it and a dish of roasted beets for the accompanying salad. Cut pumpkin in half. Scrape out and discard the seeds the stringy bits. (Or roast the pumpkin seeds!) Place each half face down in a baking dish. Fill the dish with about an inch of water and place in the oven at 400 for about 20 minutes. Remove the halves from the dish and let cool. 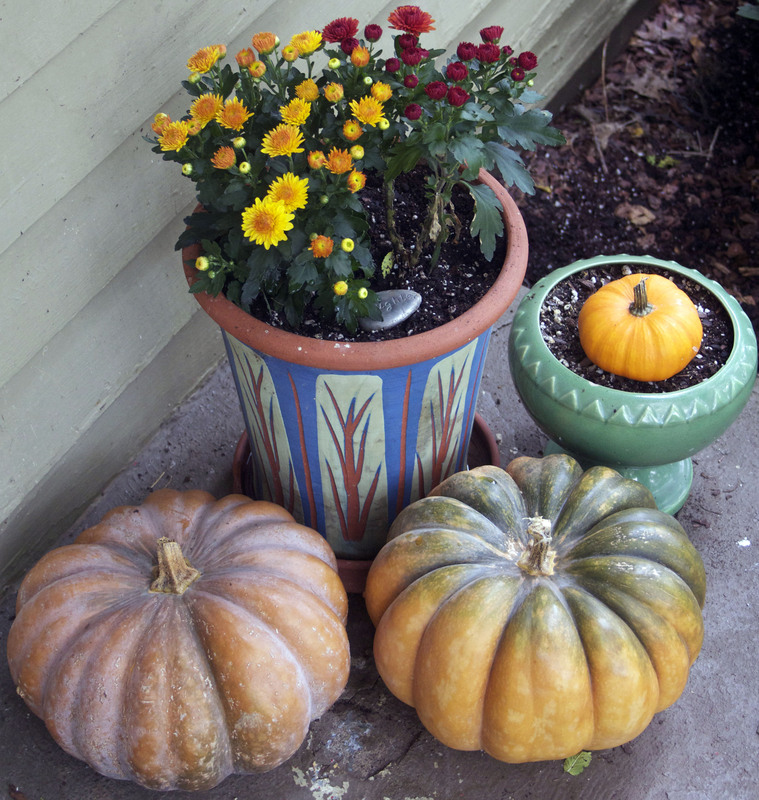 Once cool enough to touch, scoop out the pumpkin flesh into a medium bowl and set aside. Blend cashews with water. Sautee the onions in the butter in a Dutch oven or soup pot. Add garlic. 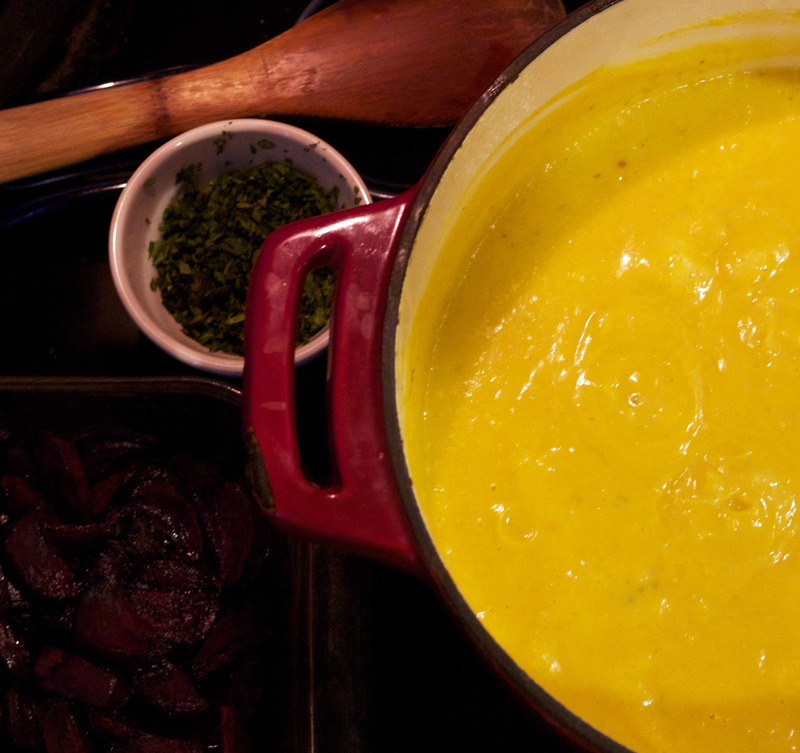 Blend the pumpkin with the stock and onions and, along with the cashew milk, add back to the soup pot. Stir and bring to a boil. Add the smoked paprika. Reduce to a simmer. Add herbs. Salt & pepper as needed. Simmer for 20 minutes. I came up with this tasty baked pasta and squash dish that I think would make a perfect Thanksgiving side dish. Preheat oven to 375. Place the squash cubes in a pan with the stock. Cook on medium high heat until the squash forks done. Turn the stove to low. Meanwhile, cook the pasta and then drain. Chop the bread into small cubes. 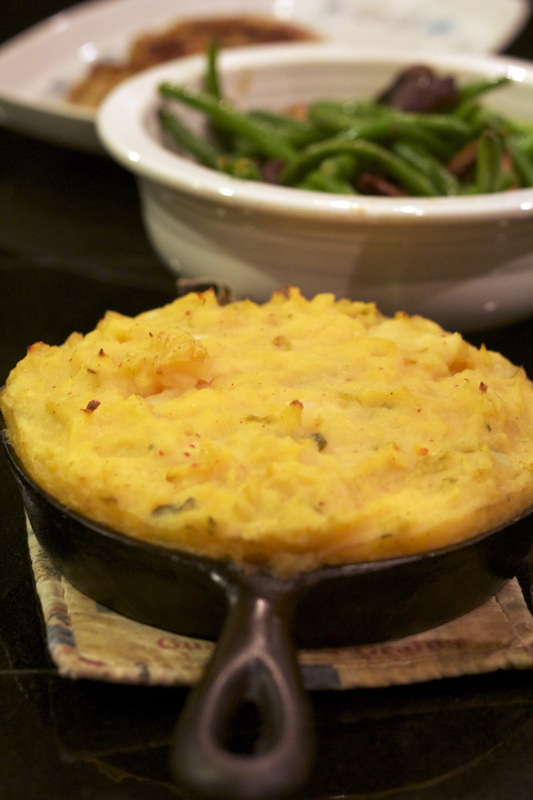 In an iron skillet, add 2 Tbsp butter and place on medium heat. Once the butter melts, add the bread and the chopped sage. Stir the bread crumbs several times as they crisp and lightly brown. Remove the bread crumbs from the stove and set aside. 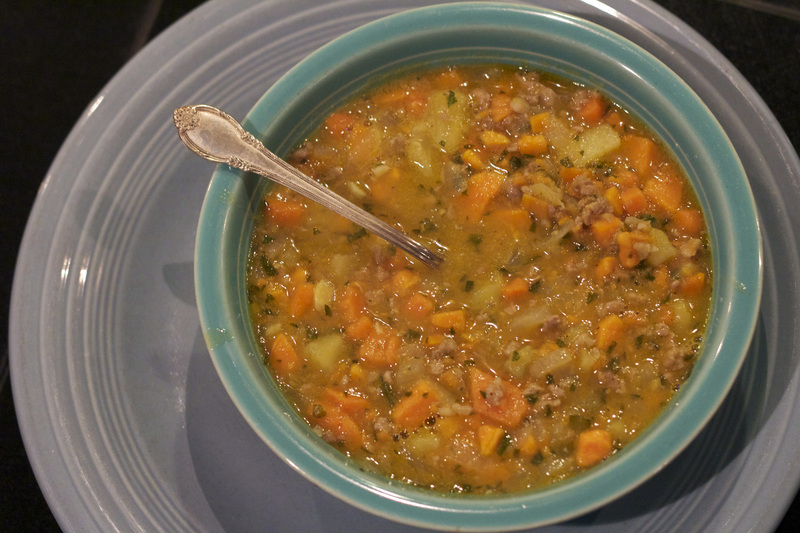 With a fork or potato masher, mash the squash in the broth. Add the milk and mustard, cayenne, nutmeg, salt and pepper. 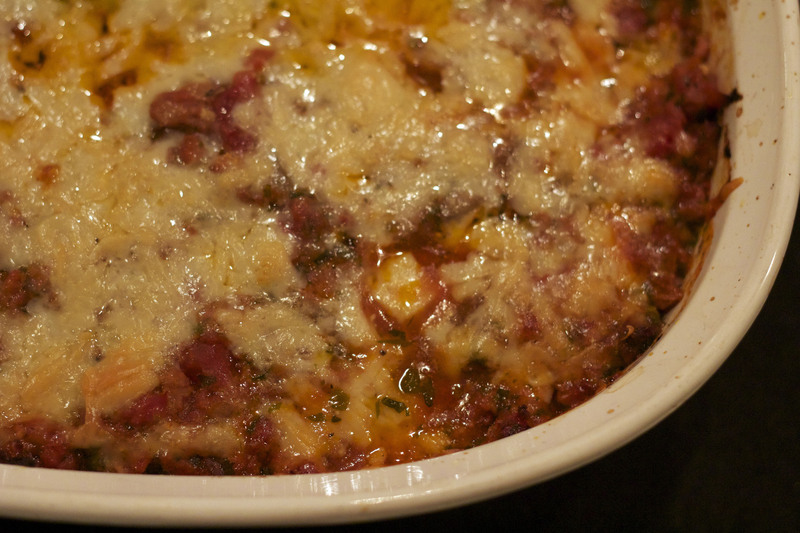 Stir together and then stir in the 1 1/2 cup cheese, reserving ½ cup for the top. Butter a baking dish and then add the pasta. Pour the squash mixture over the pasta and then top with the remaining cheese and the bread crumbs. Cover the baking dish with a piece of foil and bake for 20 minutes. Remove the foil and bake for 15 more minutes. And, holy cow, have y’all ever seen this video for He Walked On Water? It is very sweet. Speaking of sweets, I don’t have any sweet treat recipes to post this time but Lord, have I been baking and eating sweets. I was asked to assist my sweet (no pun intended) friend Melissa Corbin as she competed in the great World Food Championships in Las Vegas. We spent hours baking and experimenting together. You can read all about it and get her delicious recipe for Triple Dickel Apple and Chèvre Galette here. 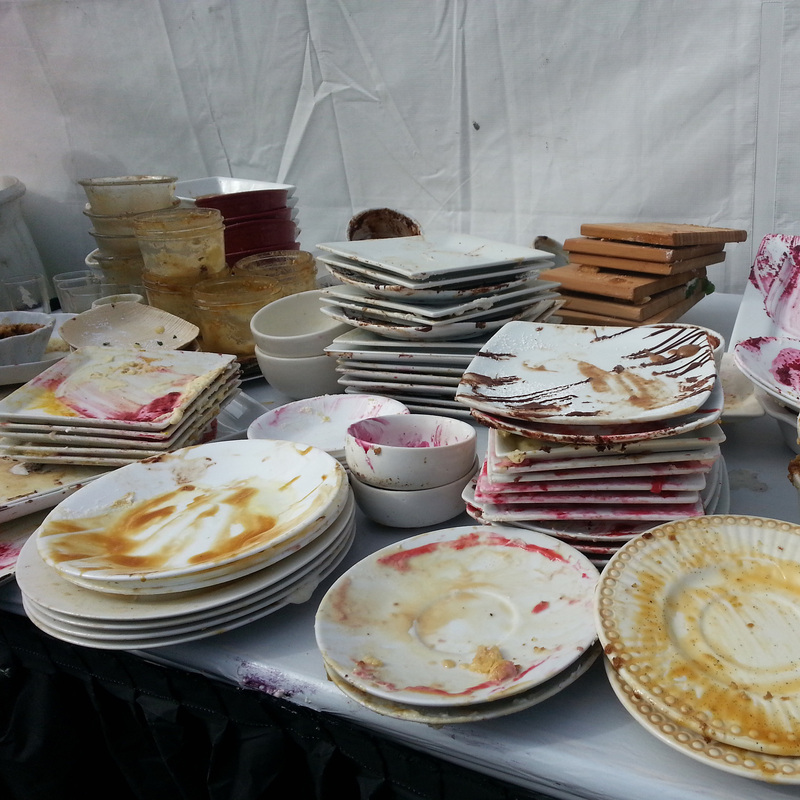 This photo of all the judges empty tasting plates pretty much sums up how I currently feel about sweets. October is Non-GMO month. GMOs (genetically modified organisms) are plants or animals that have been created through gene splicing techniques. It is changing the DNA of a plant. There is a lot of misinformation out in the world about this particular issue. One common misconception of GMOs is that they will allow us to feed more people in our ever growing world yet, none of the GMO traits currently on the market even offer increased yield, drought tolerance, higher nutrition, or any other benefits to consumers. And there is plenty of evidence now that connects GMOs to health problems, environmental damage and violation of both farmers’ and consumers’ rights. More than 60 countries around the world now have either significant restrictions or outright bans on the production and sale of GMOs (meaning, also, that they won’t allow US grown products into their country!). The bottom line is, once we have lost complete control of the source of our food, there is absolutely no turning back. The importance of labeling our food as “Non GMO” is so that people like me, who care whether or not my food has been genetically modified, can try to avoid consuming too much genetically modified food. Seriously, y’all. It’s all about personal choice and labeling non-GMOs means we all still get a choice. I’ll stop my preaching but you can find out much more about this issue at the Non-GMO Project’s site. The reason I thought to tie this topic in with this particular recipe below, though, is some of my favorite vegetables are now almost impossible to find Non-GMO (especially in middle Tennessee). In the United States, unless you can be certain you are eating organic, our corn crops, beet crops, zucchini and squash crops are pretty much all genetically modified at this point. Buying fresh vegetables has never been so confusing. In the summer, it’s easy to either grow your own food or buy seasonal, organic and local thanks to our local organic farmers! In the winter, it becomes way more complicated. We now have to think about the “Dirty Dozen” and this GMO list. Thank God for friends, neighbors, and local farmers like Double N Urban Farm (above) who provided us with lots of delicious organic produce this past summer! Now, about that recipe… I have a special place in my heart for Art Bomb Studios in Greenville, S.C. First off, one of my very favorite people in all the world, my big Sis, has a studio space there. So, I have spent lots of time here visiting her studio, attending their many art shows, or just hanging out and enjoying some food with excellent company. 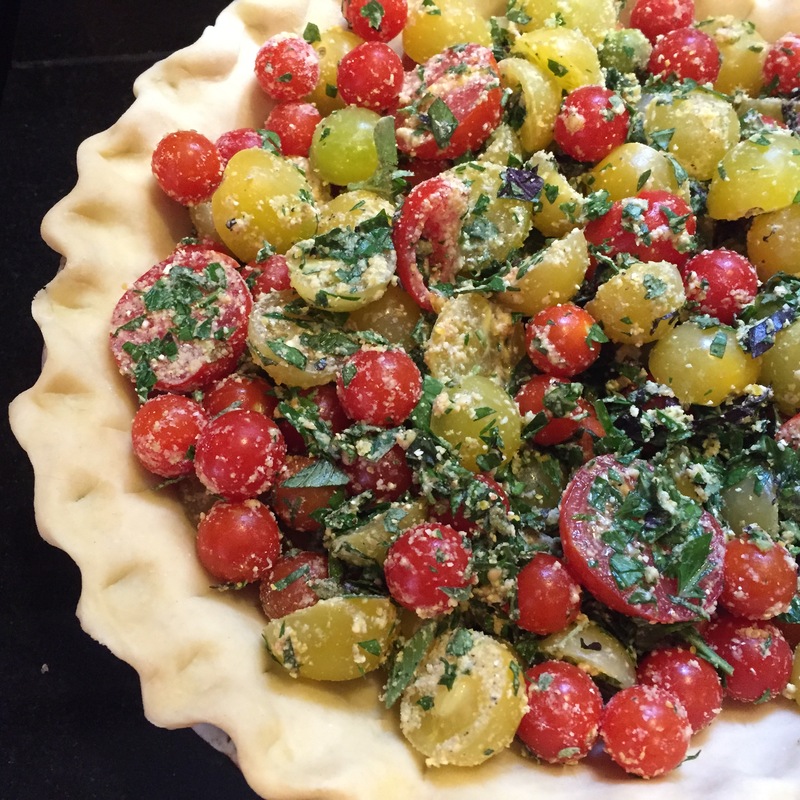 On my most recent visit, our friend and Art Bomb founder Diane shared some wonderful cookbooks with me and this very special recipe of hers for Zucchini Pie. I had never heard of such but she said it was one of her very favorite recipes and I have often made Zucchini Bread so I thought I would give it a try. I am always looking for new ways to add even more veggies into our diet. 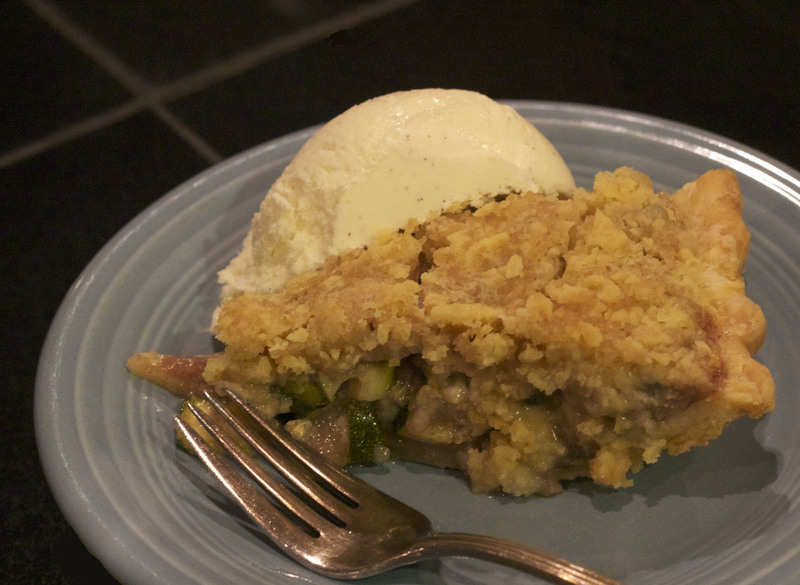 Even though it is easier to find good, local organic zucchini in the summer, this pie screamed FALL to me! Next time, I might experiment with grating the zucchini instead of cubing and it just might be tasty with some grated candied ginger thrown in. It would be great served alongside apple and pumpkin pies for a Thanksgiving day spread. Leftovers were great with a cup of coffee for breakfast. Preheat oven to 350. Mix all the filling ingredients together in a bowl and let rest for 20-25 minutes. According to Diane, this is a necessary step which allows the gasses to escape so you won’t get gas from eating it. While you let the filling rest, roll out the pie dough (PLEASE never use store-bought crust, it is so easy to make your own. Here is my basic recipe here) and make the topping by mixing the 3 ingredients together until crumbly. I just used my fingers. 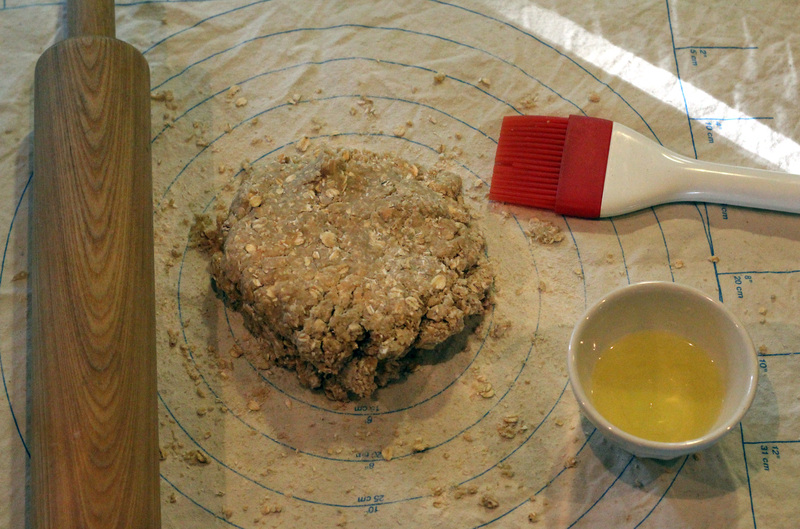 Pour filling into unbaked pie crust and then crumble topping on top. Bake for one hour. Exciting music news this week: our buddy (and proud Alabamian) Jon Byrd has a new cd out! Jon is a wonderful songwriter, storyteller and all around great human being. His song Jack Knife is seriously one of my all time favorites. With this album, his 3rd, he decided to sing the songs of some of his favorite songwriters. It’s titled, Route 41, and you can purchase it here. 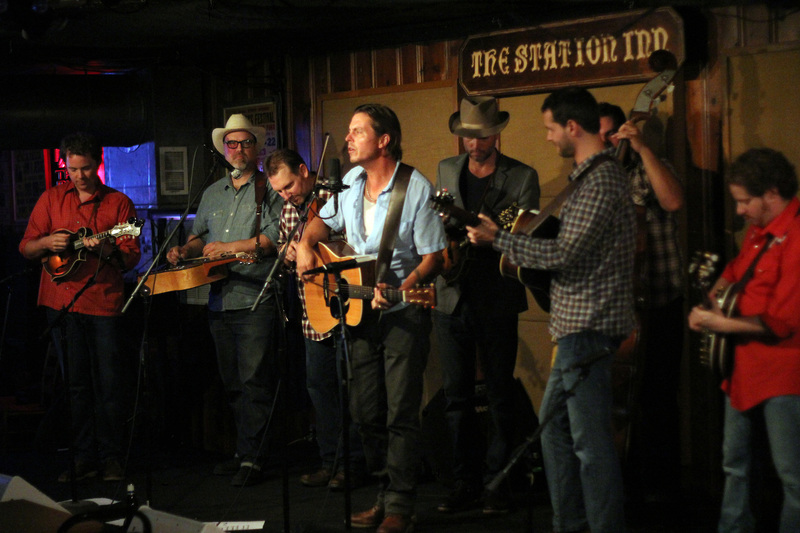 He had his cd release party at the world famous Station Inn last week. If you happened to miss it, he’s playing again next Friday. You can check out all his dates on his website. 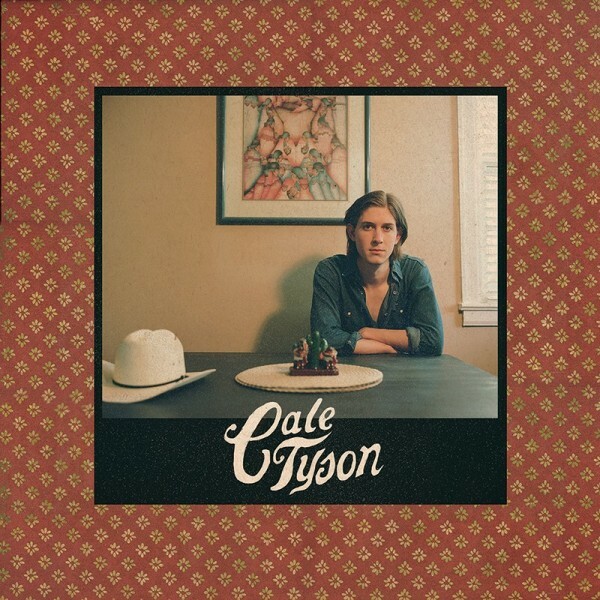 Out next week is the second EP from our buddy, Cale Tyson, titled, Cheater’s Wine. This young Texan is already getting some good reviews for his songwriting. He’s a big fan of Townes Van Zandt and has a deep respect for the oldtimers of country music. 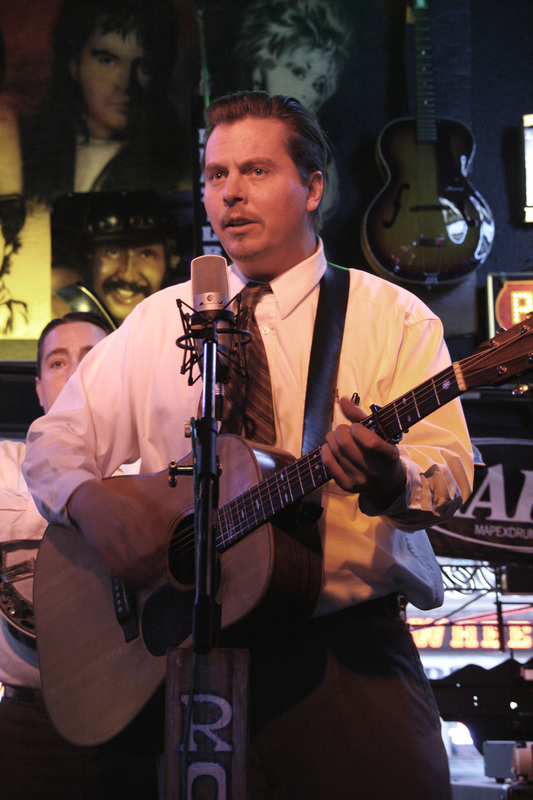 He is in a group of young Nashville songwriters who are leading the charge to keep traditional country music alive. I love them! Don’t forget to support our local artists and musicians as they are truly what make our communities thrive. Eat well, cold season is coming up! For more interesting articles about Non-GMOs and eating with purpose, visit our friends over at Corbin in The Dell. 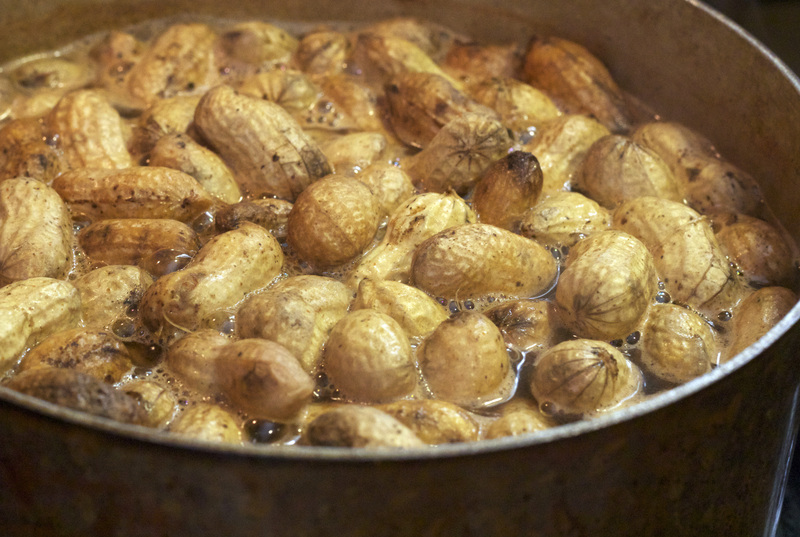 Growing up in South Carolina, hand-written “boiled peanuts” signs on the side of the road were a constant visual. 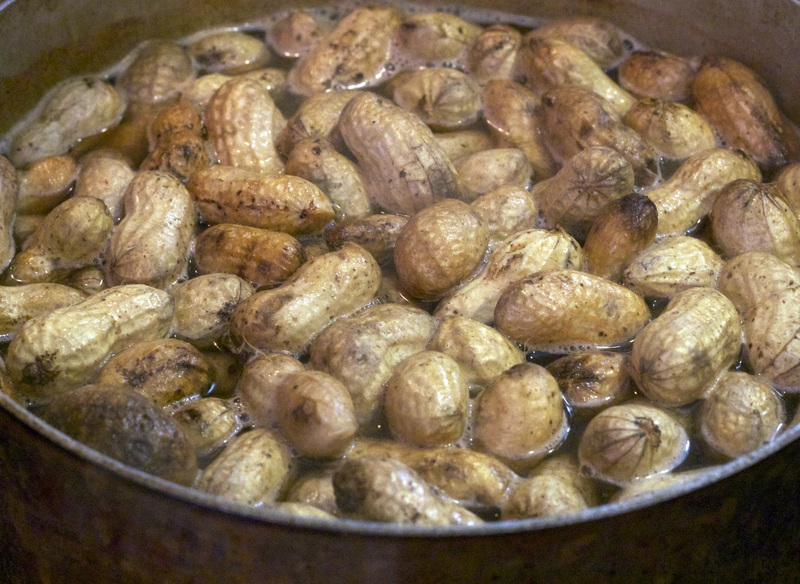 The landscape is dotted with them and nearly every convenience store has a crock pot simmering with boiled peanuts. There was never a shortage, however, I never ate them as a youngster. In fact, I thought they were gross without even ever trying them. Shameful. It wasn’t until I brought my Pacific Northwestern born and bred soon-to-be husband to the south for the first time nearly fifteen years ago that I actually tried them, as I had to give him a complete southern experience. It was then that I realized how good they actually are. When we first moved to Nashville eight years ago, we stumbled across a big bag of green peanuts at the farmer’s market and Grant was excited to make his own boiled peanuts. He did and they were delicious. But then we never saw green peanuts again until just the other day. Come to find out, you can also make these with dried peanuts in the shell which are much easier to find. 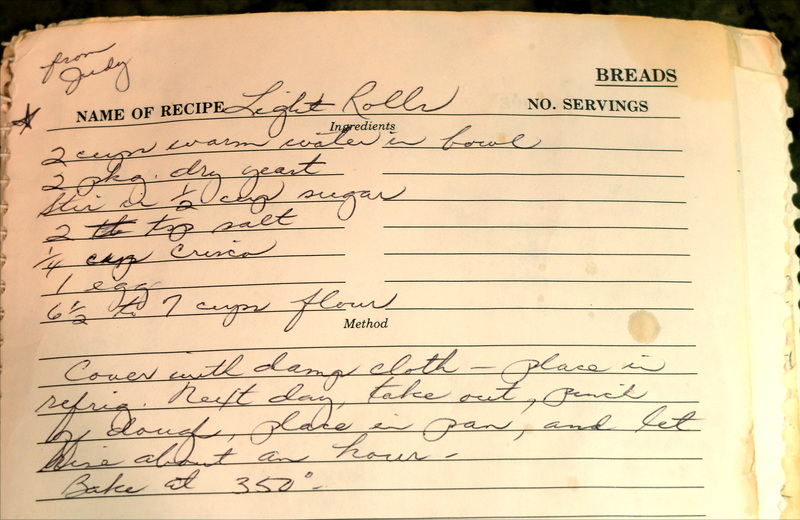 Here’s Grant’s recipe. They are so good, we ate the whole pound in one sitting! Mix spices in a pot of water. Add Peanuts. Bring to a boil and then simmer for 2-3 hours. 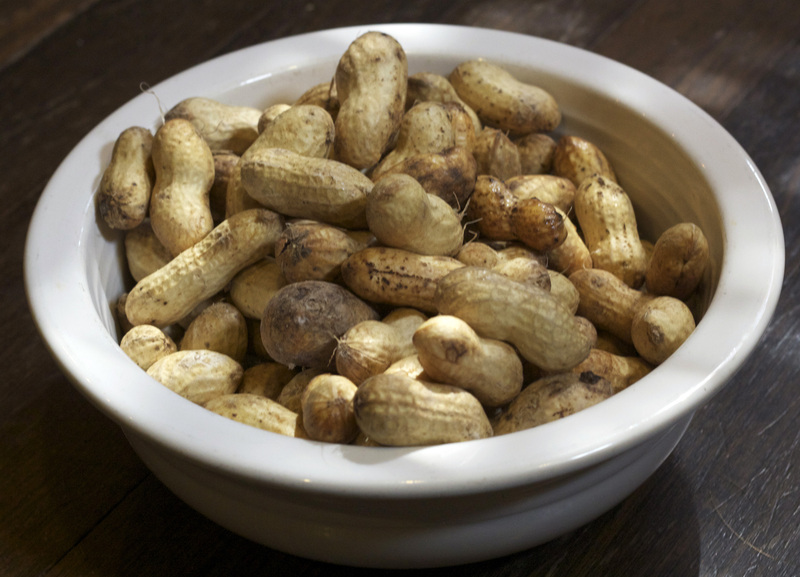 Boiled peanuts make me think of road trips and speaking of road trips, our friend and fellow Nashvillian, JP Harris, is one of the hardest working road dogs we know and he has a brand new album out! His music is country- I mean real honky-tonk country and very fun (I’m talking like Jerry Reed fun), and he’s one of the nicest guys around. You can pick up his new album, Home Is Where the Hurt Is, from Cow Island Music here. And you can be sure to hear JP Harris & The Tough Choices live because they are always on tour. You can see a full list of all the live dates on his website, here. JP Harris & The Tough Choices at the Basement. March 2014. Also, I am anxiously awaiting the new release from Margo Price. I’ve mentioned Margo before, here, back when her band Buffalo Clover’s latest cd was released. Margo has had a side country band for sometime now called Margo & The Pricetags. They were always fun but it wasn’t until she decided to make that her main musical focus that I really took notice. That’s become one of my favorite things about having lived in Nashville just as long as I have- I get to follow along and watch as many songwriters and musicians discover who they are and begin to hone in on their talents. It all starts to unfold right in front of you and it is so exciting to be a part of. Margo Price with Mark Sloan on guitar. Basement, March 2014. 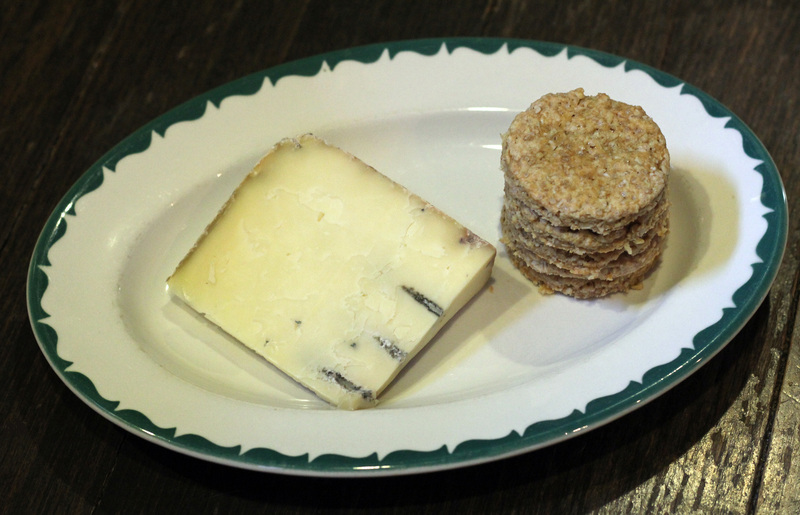 Oat Cake Crackers served with Dunbarton Blue. Grant and I both love whole grain, very slightly sweet crackers that are really somewhere in between a cracker and a cookie. When we lived in the Pacific Northwest, we could find these up in Canada or in specialty food stores around Seattle. Often they are labeled “Digestive Aids” and are popular in British food sections. 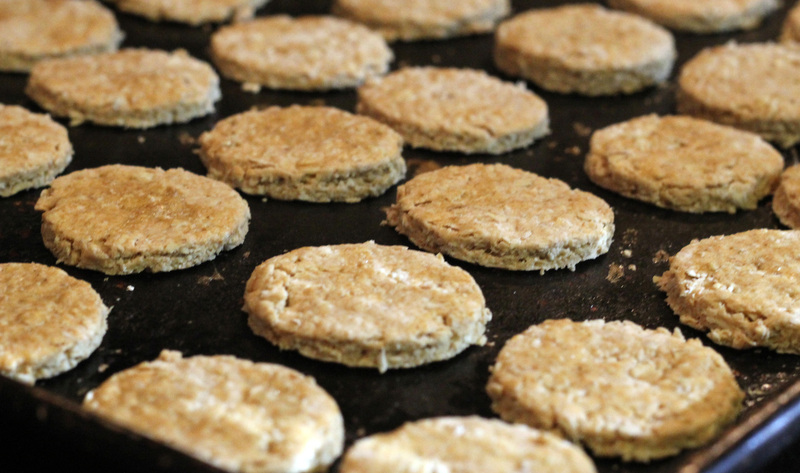 In Scotland, they call them Oat Cakes. They are a perfect companion to really good cheese, especially blue cheese. I’ve been hanging out lots at The Bloomy Rind and she has an excellent selection of U.S. artisan blue cheeses. So many! I’ve been slowly working my way through all of them which made me start to crave the little oat crackers I can’t seem to find anywhere around these parts. So, I came up with my own recipe! It’s really hard to know what to call them since the idea seems to stem from the Scottish Oat Cakes yet, they are more like cookies but since they aren’t very sweet, they are also kind of a cracker. I decided to call them Oatmeal Cake Crackers. Preheat oven to 350. 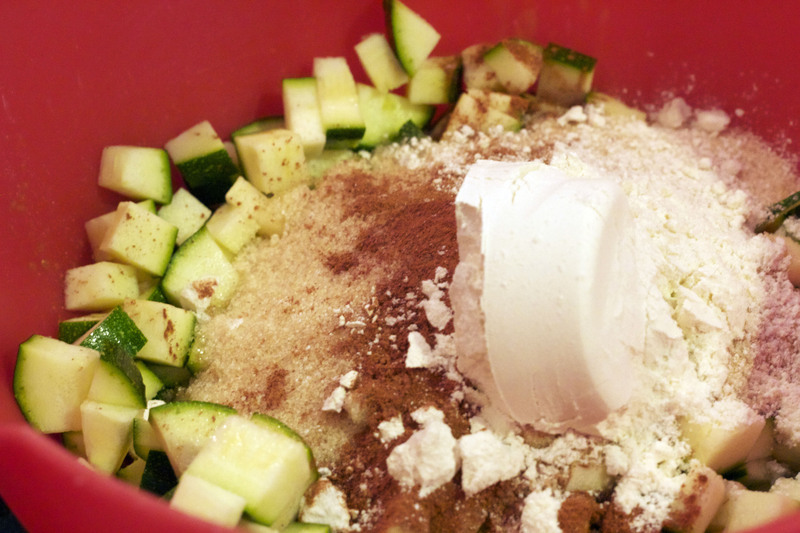 Mix all ingredients together with your hands or a food processor. Roll out on a floured surface to ¼” thickness. 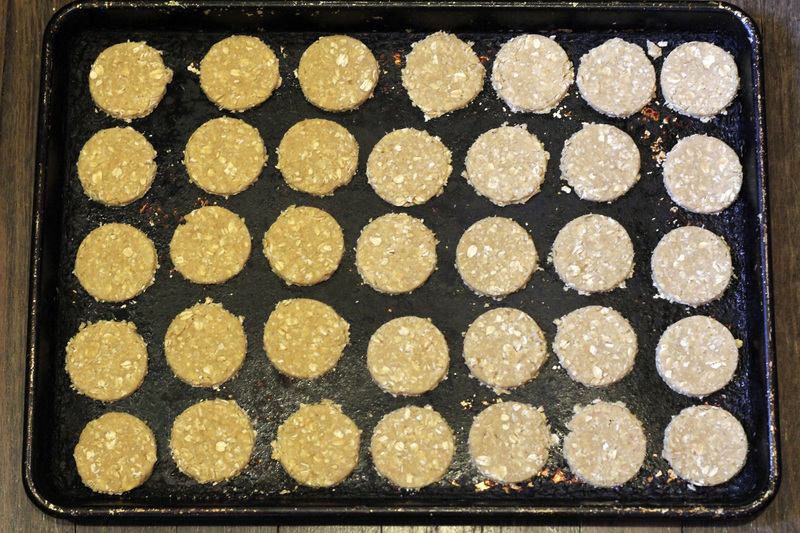 Using a small biscuit cutter, cut into rounds and place on a cookie sheet. Brush the tops with egg white. Bake for 15-16 minutes. Remove from oven and let cool on a wire rack. These are delicious with cheese, especially the blue or cheddar varieties. 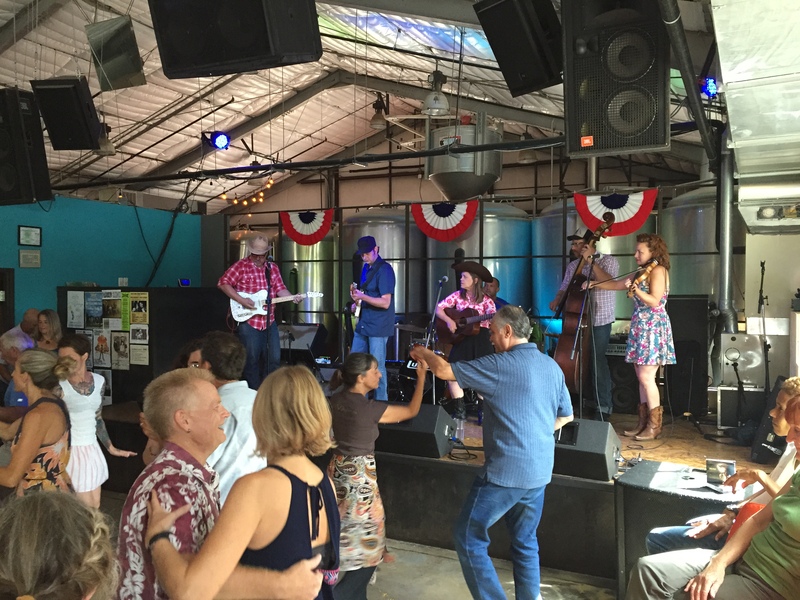 Last weekend was a big bluegrass weekend for us as Grant’s bluegrass band, Off The Wagon, had three shows. 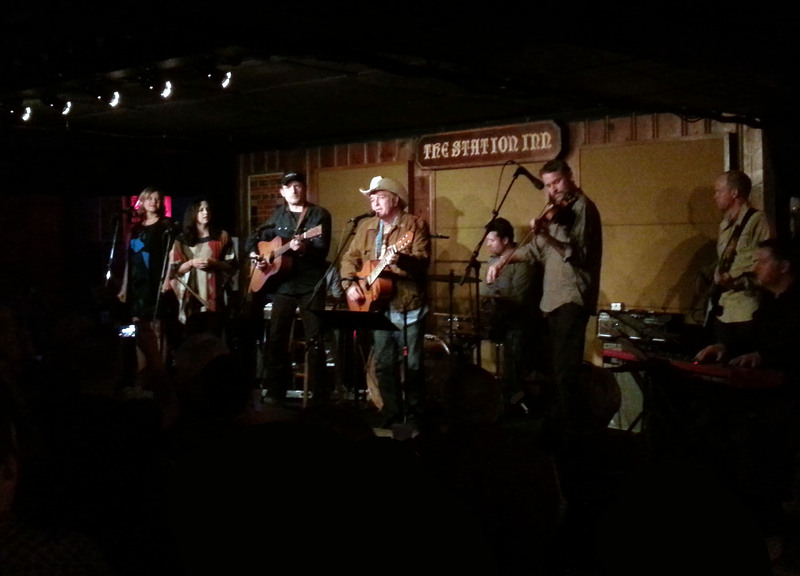 Saturday they played The Station Inn and our friend Bradford Lee Folk joined them for a few songs. It reminded me of how much I love his voice and that I forgot to mention his new album, Somewhere Far Away, which came out a couple months back. 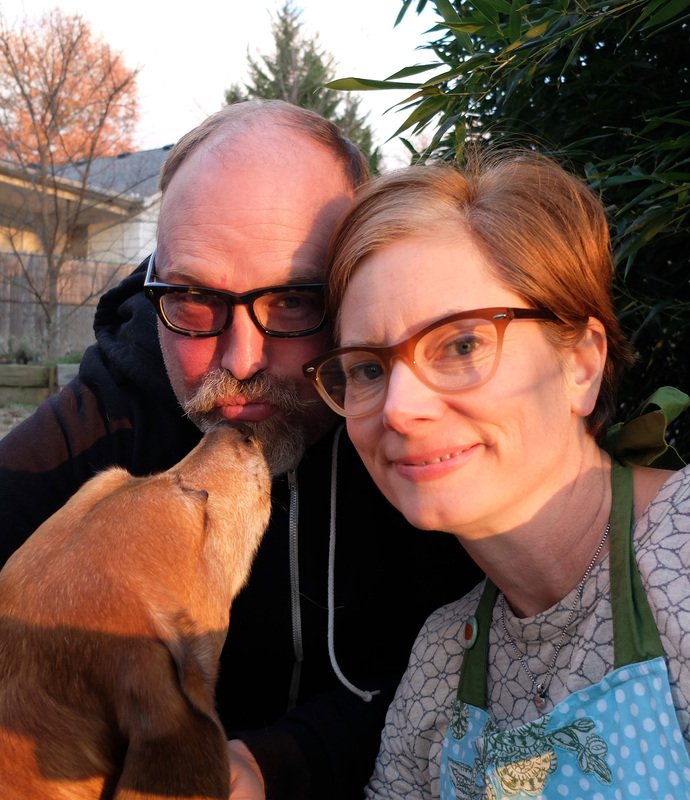 We first became familiar with Brad, or at least his voice, back when we lived in Seattle and we saw his old band Open Road play one of our favorite venues, the Tractor Tavern. So, when we first met him in Nashville a few years back, we were thrilled he had moved to town and excited to hear his new music. What a voice! You can find his new cd plus lots of other good merch and his touring dates all on his website here. His songs are so beautiful and his voice is really unique. Definitely check his music out!